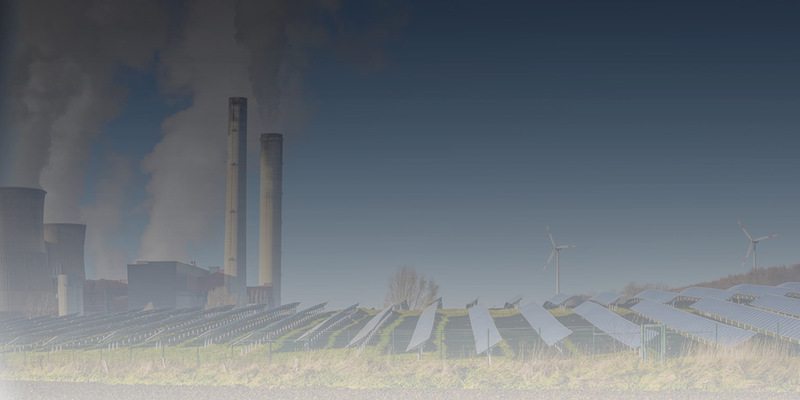 In August 2015, the U.S. Environmental Protection Agency (EPA) released the final version of its proposed Clean Power Plan (CPP), which calls for reducing emissions of carbon dioxide (CO2) from U.S. electric generating plants by 870 million tons below 2005 levels by 2030, when the EPA assumes that the CPP will be fully implemented. This paper presents the results of a comprehensive examination of the assumptions and methodology used by the EPA to estimate the costs and benefits of the CPP. This paper finds that the EPA’s cost-benefit analysis significantly overestimated the direct benefits of CO2 reductions and co-benefits of accompanying reductions in air-pollutant emissions; its analysis also significantly underestimated the specific costs of meeting future electricity demand. Estimates of future CO2 emissions, along with changes in those emissions, depend on numerous assumptions, especially future economic growth and the “carbon intensity” of the economy, i.e., the average amount of CO2 emitted for each dollar of world economic output. Because of the difficulties in forecasting the rate of technological change and future economic growth, long-term forecasts of CO2 emissions are highly uncertain—and that uncertainty increases over time. Estimates of the SCC compound that uncertainty because the models used to estimate SCC values rely on arbitrary inputs regarding climate sensitivity and feedback effects, as well as arbitrary inputs to measure the relationship between CO2 emissions and economic well-being. Ultimately, however, the EPA’s estimates of billions of dollars in annual benefits from CO2 emissions are unsupportable, not because of the arbitrariness of SCC values but because the CPP will have no physically measurable impact on world climate, estimated to be less than 0.01 degrees Celsius by the year 2100 using an EPA-sponsored climate model. Without any measurable impact on world climate, the CPP cannot provide any climate-related benefits, regardless of the estimated SCC. Perhaps as a consequence of the CPP having no measurable impact on world climate, the EPA also couches the benefits of the CPP in strategic terms: specifically, that the U.S. must lead if other countries, especially China and India, are to follow and enact their own CO2 emissions-reduction policies. This seems doubtful, for two reasons. First, past experience with the 1998 Kyoto Protocol, which was also an agreement to reduce world CO2 emissions, suggests that this type of leader-follower strategy is unlikely to work because the greater the actions taken by leaders, the greater are the benefits of free-riding by potential followers. Second, compliance with the multinational climate agreement that was signed in Paris in December 2015 (known as COP21, or the Paris Agreement) is strictly voluntary. Importantly, all the “intended nationally determined contributions” (INDCs) submitted in advance by signatories to the Paris Agreement will themselves have little or no measurable impact on world temperature by the year 2100: less than 0.2 degrees Celsius, based on the same EPA-sponsored climate model. It seems unlikely that developing nations, such as China and India, will restrict their domestic economic growth by imposing higher energy costs for the sake of uncertain climate-related benefits far into the future. The EPA’s estimates of co-benefits from future air-pollution reductions also suffer from significant uncertainty and modeling errors. The reasons for this include: (i) unrealistic assumptions about increases in the rate of technological improvement for coal-fired generating plants under the CPP, plus the fact that the EPA ignored the potential adverse economic impacts of such improvements under its own New Source Performance (NSP) rules; (ii) use of epidemiological models that assume that there are no threshold air-pollution concentration levels below which additional health benefits cannot be obtained, even though under the Clean Air Act, the EPA is required to establish exposure levels that are supposed to incorporate an adequate margin of safety to protect the public health; and (iii) incorrectly defining all deaths attributed to particulates and ozone exposure as “premature,” even though the probability of eventual death is necessarily 100 percent. As a consequence of these errors, the EPA has likely significantly overstated the magnitude of these benefits and may have double-counted benefits already captured in the agency’s other air-pollution rules. The EPA also significantly understates CPP compliance costs for at least four reasons. First, the EPA’s modeling framework assumes that generation-plant owners and investors have perfect knowledge about the future and will make generation-plant investment and operation decisions accordingly. But that does not reflect how generation-plant owners and investors make decisions and likely caused the EPA to overestimate investments in operating-efficiency improvements under the CPP. Second, the EPA annualized the actual costs that consumers will pay for energy-efficiency investments over those investments’ expected lifetimes, rather than accounting for the costs at the time of purchase. Third, the EPA relies on unsupported projections of increasing wind and solar plant output, combined with decreasing capital and operating costs. And fourth, the EPA ignores the additional costs associated with necessary upgrades to the U.S. high-voltage transmission system to accommodate a doubling of wind and solar capacity by 2030, as well as the additional costs of fossil-fuel generation needed to back up intermittent wind and solar generation production. Finally, the EPA’s cost-benefit analysis suffers from a fundamental flaw, in that the analysis compares estimates of world economic benefits against a subset of U.S.-only costs. The EPA justifies the worldwide scope of benefits, not only because CO2 emissions affect global climate but also because the U.S. operates in a globally interconnected economy. True enough; but on the cost side, the EPA looked only at the change in cost to meet future U.S. electricity demand. The EPA ignored the broader impacts on the U.S. economy—notably, potential reductions in future U.S. GDP growth resulting from higher electric costs—and ignored the impact of changes in future U.S. economic growth on the world economy because of those same worldwide economic interconnections. This apples-to-oranges comparison of benefits and costs is a fundamental flaw of the Regulatory Impact Analysis (RIA), the EPA’s name for cost-benefit analysis. The many flaws of the EPA’s cost-benefit analysis of the CPP do not necessarily mean that the U.S. should not adopt any policies to address climate change. While cost-benefit analysis is a component of evaluating proposed policies—and an important one, at that—it should not be viewed as some sort of policymaking deus ex machina. Development of optimal climate-change policies—including whether an optimal policy is to do nothing specific to reduce future CO2 emissions—depends on many factors, not the least of which are highly uncertain computer models. But such policies also hinge on attitudes toward future risks, whether society must purchase “insurance” against those risks, and, if so, how much insurance should be purchased. Moreover, development of optimal climate-change policies must confront the inevitable trade-offs between devoting resources to address more current issues (e.g., access to clean water, vaccinations against debilitating diseases, and ample supplies of low-cost energy to improve economic growth) and devoting resources to address potential future impacts from climate change. None of these are simple issues, and all involve inherently subjective factors. No other environmental issue today is the subject of more discussion, debate, and media coverage than human-induced climate change, which is supposedly caused by increasing emissions of carbon dioxide from the combustion of fossil fuels. These debates cover everything from basic questions of physical measurement—How has the earth’s climate changed over time? How may the climate change in the future because of increased CO2 concentrations in the atmosphere?—to how increased CO2 emissions will affect the economic well-being of future generations. In the U.S., the transportation and electric power-generation sectors are the largest sources of CO2 emissions. But regulating emissions from trains, planes, and automobiles, of which there are millions, is more difficult from a policy standpoint than regulating CO2 emissions from stationary power plants. Therefore, to reduce CO2 emissions associated with electric power generation, on August 3, 2015, President Obama and U.S. Environmental Protection Agency Administrator Gina McCarthy announced a new Clean Power Plan (CPP),4 which is supposed to reduce U.S. CO2 emissions from electric generation, particularly those from coal-fired power plants. The CPP is supposed to reduce those CO2 emissions 32 percent below their 2005 level of just over 2.4 billion metric tons (equal to about 2.65 billion short tons), or, according to the EPA’s calculations, about 870 million short tons per year, by 2030, the year in which the agency assumes that the CPP will be fully implemented. The CPP requires all U.S. states, except Alaska and Hawaii, to achieve specific reductions in CO2 emissions associated with generating electricity. States can achieve these reductions in one of two ways: (i) a rate-based approach that requires states to meet a specific maximum average emissions goal per megawatt-hour (MWh) of electricity generated; or (ii) a mass-based approach that requires states to meet specific annual CO2 emission caps measured in short tons. By comparison, in 2013, total New York State CO2 emissions from electric generation were estimated by the U.S. Energy Information Administration (EIA) to be 33 million short tons. Although the required reduction in CO2 emissions of about 2 million short tons is only about 6 percent below 2013 emissions, the 2013 emissions total reflects the CO2-free generation from six nuclear power plants in the state, which face political and economic pressures to close. For example, Governor Cuomo has called for closing both Indian Point nuclear units. The state’s four other nuclear plants face economic pressures from continued low natural gas prices, which are keeping wholesale electric power prices low. In 2013, New York’s six nuclear plants generated about 44.8 million MWh, almost one-third of the total electric generation in the state. Replacing those plants with electricity generated from state-of-the-art natural gas–fired units would produce almost 17 million tons of CO2. Cost-benefit analyses of major federal regulations like the CPP are required under Executive Order 12866 (1993), Executive Order 13563 (2011), and OMB Circular A-4 (1993). [17 The EPA’s “Guidelines for Preparing Economic Analyses” (2014) embodies the legal requirements set forth in these two executive orders and in OMB Circular A-4. The EPA’s cost-benefit analysis estimated that total benefits would range between $34 billion and $54 billion per year (2011$) by 2030, the year in which the EPA assumes that the CPP will be fully implemented. The EPA estimated that the CPP would impose costs of less than $9 billion per year. Of those projected annual benefits in 2030, the EPA estimated the direct worldwide benefits from CO2 emissions reductions would be $20 billion. The EPA analysis does not provide a separate breakdown of CO2 reduction benefits accruing to the U.S. The remaining $14 billion to $34 billion (roughly 40 percent to 60 percent) in estimated annual benefits are co-benefits associated with reductions in emissions of sulfur dioxide (SO2) and oxides of nitrogen (NOx). 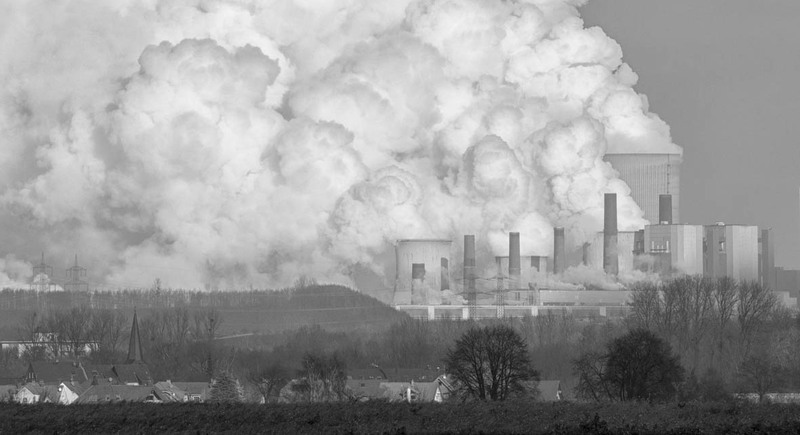 That is, by reducing CO2 emissions from the electric power sector, the CPP will also reduce emissions of SO2 and NOx—hence the term “co-benefit.” Emissions of these two pollutants lead to formation of particulates and ground-level ozone, which are associated with deaths from heart and lung diseases, as well as illness. The estimated co-benefits arise from the EPA’s predictions of fewer premature deaths, asthma attacks, sick days, and hospital admissions. Finally, the EPA notes numerous unquantified benefits associated with the CPP. These include everything from other health-related benefits (e.g., reductions in annual bronchitis cases because of lower particulate emissions) to better visibility and reduced harm to wildlife. The EPA estimated annual costs of implementing the CPP of between $5.1 billion and $8.4 billion in 2030 under the mass-based and rate-based approaches, respectively. These compliance costs stem from the EPA’s estimates of the higher costs of meeting future U.S. electric demand, along with minor additional costs for reporting and record-keeping. This paper presents a critical review of the validity and accuracy of the EPA’s cost-benefit analysis, and whether that analysis justifies implementation of the CPP. Section II addresses the validity and accuracy of the EPA’s direct benefits estimates from expected carbon reductions. Section III addresses the co-benefits estimates. Section IV addresses the validity and accuracy of the EPA’s compliance cost estimates. And Section V offers conclusions and policy recommendations. The primary purpose of the CPP is to reduce CO2 emissions, which are the source of most greenhouse gas emissions. As the EPA states: “The emission of greenhouse gases (GHGs) threatens Americans’ health and welfare by leading to long-lasting changes in our climate.” Thus, this paper begins with a comprehensive review of how the EPA estimated the benefits of reduced CO2 emissions projected to arise because of the CPP. As this section discusses, the EPA’s estimated benefits are speculative, highly uncertain, and overstated, primarily because the CPP will have no actual impact on world climate. where ΔCO2,T is the estimated reduction of CO2 emissions in year T because of the CPP, and SCCT is the estimated value of the SCC that year. The EPA estimated carbon reduction benefits for the years 2020, 2025, and 2030. The reduction in CO2 emissions in a given year equals the difference between CO2 emissions under the EPA’s business-as-usual scenario (i.e., without the CPP in place) and CO2 emissions under the CPP. For example, the EPA’s projected net reduction in CO2 emissions in 2030 is 415 million tons. This is less than half the mandated 870-million-ton reduction below the 2005 emissions level because CO2 emissions from the U.S. electric-generation sector have already decreased significantly since 2005, owing to greater reliance on natural gas–fired generation and improvements in power-plant operating efficiencies. 415 million tons • $48/ton = $19.92 billion, or about $20 billion. Thus, the estimated direct benefits of the CPP from future CO2 reductions depend on two factors: (i) the economic model used by the EPA to determine the difference in electric-generation-related CO2 emissions between the EPA’s business-as-usual scenario and the CPP; and (ii) the climate models used to estimate the SCC. Economists define social costs as costs that accrue both to private individuals and to society at large. For example, a gallon of gasoline having a market price of $2.50 is its private or market cost. But burning a gallon of gasoline also causes air pollution, the costs of which may not be reflected fully in the market price. This additional nonmarket cost is called an “external cost” because it is outside the normal market transaction. Social cost, then, is the sum of the market cost and the external cost. Unlike gasoline, CO2 emissions are not priced in the market. Therefore, the SCC is composed entirely of external costs. The SCC values used by the EPA were developed by the White House Interagency Working Group on the Social Cost of Carbon (IWG), which includes the EPA. [30 The IWG used three climate models to estimate the change in economic output in the future associated with greater CO2 emissions (and resulting climate changes) in a given year (Figure 1). In Figure 1, for example, an increase in CO2 emissions in 2030 is assumed to cause additional warming of the earth’s climate over time. That warming, in turn, is assumed to cause a reduction in future world economic output, such as agricultural production, and requires additional investments to mitigate adverse climate impacts, such as constructing seawalls to reduce flooding in coastal cities. Economists term these impacts a “loss in social welfare.”31 Because the economic impacts occur over a long period of time, impacts in future years are discounted to the emissions year to account for the time value of money. In other words, because of the time value of money, a $1 million impact 100 years from now has a lower present value than a $1 million impact today. By comparison, world CO2 emissions in 2014 were estimated to be about 32 billion tons. Those emissions are expected to increase by about 25 percent by 2035, to about 40 billion tons (Figure 2). Thus, the CPP proposes to reduce projected world CO2 emissions by only about 1 percent that year, based on the goal to cut 415 million tons by 2030. Moreover, in 2015, China announced that it had been burning more coal every year since 2005—about 600 million additional tons in 2012 alone—than it had previously disclosed. These new coal-consumption data mean that China’s annual CO2 emissions are more than 1 billion tons larger than previously reported—more than twice the proposed CO2 reductions from the CPP in 2030. The impact of the CPP on projected world CO2 emissions leads to a third factor affecting the EPA’s estimates of the direct benefits of the CPP: whether the CPP will have any measurable impact on world climate. The EPA never considered this third factor, even though, as explained later, it is a linchpin of the EPA’s climate-benefit estimates. The SCC values that the EPA used to estimate the primary benefits of the CPP were first estimated by the IWG in a 2010 report. The IWG updated its analysis, along with the estimated SCC values, in 2013 and again in July 2015. The EPA used the SCC values from that July 2015 report to estimate the benefits of the projected CO2 reductions under the CPP. As was shown in Figure 1, the SCC in a given year represents the cost of the present value of an additional ton of CO2 emitted into the atmosphere in that year. The present value cost of additional carbon emissions is based on the projected changes in world economic output and consumption, as measured by gross domestic product (GDP), over time. The models used to estimate the SCC assume that CO2 emitted in a given year will affect the climate, as well as world GDP, for centuries thereafter. Because the SCC is measured in dollars per ton terms, ideally the SCC should be estimated by evaluating the impacts of each additional ton of CO2 emitted. That is, the SCC should represent the marginal cost of each additional ton of CO2. In fact, however, none of the models used to estimate the SCC does this. Instead, these models compute average per-ton SCC values based on large changes in CO2 emissions under different scenarios. As discussed below, this difference is important because the reductions in CO2 contemplated by the CPP are far smaller than the emissions changes used by the models to estimate SCC values. The models used to estimate the SCC typically extend several hundred years into the future. Although the impacts of carbon emissions may extend further into the future, the discounted values of future changes in world economic output so far into the future are negligible when the 3 percent and 7 percent discount rates called for by OMB Circular A-4 are used. The choice of discount rate used to calculate the SCC in a given year is also a critical (and controversial) factor in estimating the benefits of reduced CO2 emissions. The SCC values used by the EPA were developed from three Integrated Planning Models (IPMs). IPMs combine simplified versions of climate models (i.e., models that predict changes in world temperatures and regional climate) with simplified models of world economic output. IPMs first predict changes in local climates over time caused by increases in world CO2 emissions and temperature. Based on these predicted changes in world temperatures and climate, the models then estimate the changes in economic output over time and the costs to mitigate the predicted adverse impacts of higher CO2 emissions. For a given year, the discounted present value of the change in economic output divided by the change in CO2 emissions in that year equals the SCC. In other words, the SCC in a given year is an average per-ton estimate. The SCC values that emerge from the IPMs depend critically on three factors: (i) estimates of climate sensitivity, i.e., how increased CO2 emissions affect the level and rate of temperature change; (ii) the damage functions linking higher temperatures to changes in world economic output; and (iii) the discount rate applied to future changes in economic output and mitigation costs. The three IPMs used by the IWG all make different assumptions about these three factors, which accounts for the wide variation in the estimated SCC values that the models produce. Despite the IPMs relying on “simplified” models of climate and world output, the actual mechanics of estimating SCC values are complex and subject to significant uncertainty. Moreover, it turns out that the estimated SCC values are all based on arbitrary modeling assumptions that lack any economic basis. In effect, SCC values are creatures of their human modelers’ personal preferences and assumptions. The problem is that basing climate policy—or any public policy that will impose billions of dollars in costs on U.S. consumers and businesses each year—on the arbitrary preferences of a few modelers is, at the least, questionable in terms of both overall economic efficiency and equity. Estimates of future CO2 emissions depend on numerous assumptions, especially future economic growth and the “carbon intensity” of the economy, i.e., the average amount of CO2 emitted for each dollar of world economic output. Because of the difficulties in forecasting the rate of technological change and future economic growth, long-term forecasts of CO2 emissions are highly uncertain, and that uncertainty increases over time. Yet IPMs simulate world climate and economic changes over periods of centuries. For example, because of technological improvements, total U.S. energy-related CO2 emissions in 2014 were 600 million metric tons lower than 2005 levels, 5.4 billion metric tons versus 6 billion metric tons, even though U.S. inflation-adjusted GDP increased by more than $1.7 trillion, or 12 percent, in that period. Thus, rather than economic growth in the U.S. being associated with greater CO2 emissions (a positive correlation), emissions have decreased as the economy expanded (a negative correlation). Will that relationship apply over the next two centuries in the U.S.? What about in other developed nations? And how will carbon intensity change in developing nations seeking to raise the standard of living for their citizens as rapidly as possible? The simple answer is that nobody knows. Nor does anyone know what role the uncertain amount of future CO2 emissions will play in determining the overall change in future global temperatures, as well as the rate of change in those temperatures. As MIT professor Robert Pindyck notes, future temperature changes depend on complex feedback mechanisms, which are poorly understood and “for the foreseeable future may even be unknowable.” Moreover, the assumed feedback mechanisms are all self-reinforcing, that is, they are based on assumptions that increases in world temperature cause climate changes that lead to still more increases. Yet, despite massive climate upheavals in the past, such as volcanic eruptions and ice ages, feedback mechanisms have been negative: extremes of climate have been followed by reversion back to climate equilibrium. Nevertheless, these “unknowable” climate feedback mechanisms are used to predict future changes in climate. Then those predicted changes in climate are linked to additional assumptions that link climate changes to changes in world economic output and mitigation costs—again, using what Pindyck claims are arbitrary assumptions. Moreover, these “unknowable” feedback mechanisms drive changes in economic output, which affect overall CO2 emissions. The economic damages depend on the assumptions made about the costs to reduce CO2 emissions and reduce future temperature changes, which depend on forecasts of the rate of technological change. Again, however, the modeling parameters used are arbitrary, which is why Pindyck concludes that IPMs provide little or no useful information for policymakers. To estimate the benefits from reduced CO2 emissions under the CPP, the EPA used an average of the SCC values determined by three IPMs: DICE, FUND, and PAGE. Each model uses its own set of assumptions about climate sensitivity and economic damages. The IWG calculated SCC values using each of the three models. These calculations were based on five of ten alternative future climate scenarios developed in 2009, as part of an exercise by the Stanford Energy Modeling Forum (EMF), using still other IPMs. The Stanford EMF models were designed to estimate future changes in CO2 emissions and atmospheric concentrations, based on assumptions about: (i) future maximum atmospheric CO2 target levels, measured in parts per million (ppm); (ii) whether the maximum target levels could be exceeded temporarily; and (iii) whether all nations participated in mitigation or only some did. The Stanford EMF scenarios envision large changes in future world CO2 emissions, from the levels of about 30 billion metric tons in 2010 to between 13 billion and 118 billion tons in 2100 (Figure 3). All five scenarios project large increases in world GDP by 2100, compared with GDP in 2000, increasing from about $38 trillion (2005$) to between $268 trillion (MERGE) and $370 trillion (MiniCAM). As described in the IWG’s 2010 report, four of the EMF scenarios (IMAGE, MERGE, MESSAGE, and MiniCAM) were chosen as alternative business-as-usual futures. The fifth scenario represented one in which CO2-equivalent concentrations were stabilized at 550 ppm, requiring significant reductions in world CO2 emissions to compensate for the fact that CO2 emitted into the atmosphere remains there for decades. Each of these models used different assumptions about future GDP, population, and emissions growth. The fifth scenario used the averages of the other four scenarios. Each model assumed that new nuclear generation and carbon-capture generation technologies would be available at different costs. In some cases, the models could not be solved. That is, some of the models could not keep CO2 concentrations below the specific maximum concentration levels without spending more than 100 percent of world GDP to do so. For the scenarios that were solvable, the models calculated a wide range of SCC estimates. For example, in 2020, the different models used by the EMF calculated SCC values of between $1/ton and $1,300/ton (2005$). The IWG used the Stanford scenarios and ran them through the three different IMPs to generate its own set of SCC values. However, the IWG did not restrict CO2 emissions to remain below the concentration limits set out in the Stanford models. As Pindyck discusses, uncertainty about different parameter values, such as climate sensitivity, if addressed at all, was evaluated by the IWG using Monte Carlo simulations, which result in pseudo-probability distributions of the calculated SCC values. Figure 4, for example, reproduces, from the IWG’s 2015 update, the range of SCC values calculated by the DICE, FUND, and PAGE models. 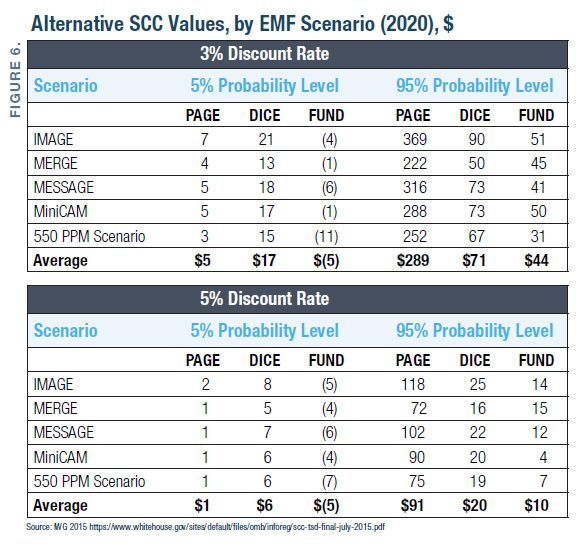 Figure 6 shows the “5 percent probability” and “95 percent probability” values in 2020 from the 2015 IWG report, for the five EMF scenarios and for each of the three models (DICE, FUND, and PAGE)—a total of 15 estimates. That is, based on the Monte Carlo analysis, 5 percent of the estimated SCC values are less than the “5 percent probability” values reported by the three IPMs, and 5 percent are greater than the “95 percent probability” values. Again, the distributions of the SCC values are not the same as true probability distributions; they are modeling artifacts arising from the assumptions of each modeler. To summarize, the estimated SCC values used by the EPA are based on three IPMs and five energy futures selected by the IWG, energy futures that were themselves based on a 2009 analysis developed by the Stanford Energy Forum using the three other IPMs. The results in Figure 6 are also shown for two alternative discount rates: 3 percent and 5 percent. Figure 7 shows the individual model-scenario average SCC values for 2020. Using a 3 percent discount rate, the overall average of the 15 estimates is $42/ton, but the average values produced by each model and each scenario range from $11/ton to $87/ton. Similarly, at a 5 percent discount rate, the overall average SCC value is $12/ton, but the individual values range from $0/ton to $27/ton. The discount rate represents the “time value of money” and is commonly applied in cost-benefit and financial analyses in which costs and benefits accrue over time. Doing so enables those costs and benefits to be compared on an equivalent basis. For example, individuals will prefer receiving $1,000 today rather than ten years from now; they value $1,000 today more than $1,000 ten years from now. How much more depends on an individual’s discount rate. The greater an individual’s discount rate, the lower he will value a future payment relative to a payment today. From the standpoint of investments today that provide returns in the future, discounting is a matter of overall economic efficiency and the opportunity cost of capital (i.e., investments today that provide a return on capital). For example, a business contemplating investing in a new machine today will do so if the expected returns provided by that machine are greater than other alternative investments. In the context of climate change, however, economic-efficiency arguments about the opportunity cost of capital become enmeshed in arguments about intergenerational equity and fairness, as well as risk aversion. There is a huge literature on the “right” discount rate to use when evaluating potential societal investments, as well as the appropriate discount rate to use when evaluating policies that address climate change. For example, some argue that it is unethical to discount the welfare of future generations relative to the current generation’s welfare, and thus the appropriate discount rate is zero. Indeed, some have even suggested that climate-change policies ought to be evaluated using a negative discount rate. Using a negative discount rate to evaluate climate-change policies—or any policy, for that matter—leads to absurd conclusions because it means that the future should be valued more highly than the present, and the further into the future, the greater the value. In other words, society today should be willing to spend more to prevent an adverse environmental outcome expected to take place 1,000 years from now than one expected to occur one year from now. It also means that each generation ought to impoverish itself for the benefit of future generations, and thus every generation will be impoverished. From an economic-efficiency standpoint, which is the framework for the EPA’s benefit-cost analysis, the appropriate discount rate is the social opportunity cost of capital (SOC). The SOC can be thought of as a weighted average return on capital investment from all sources of capital. OMB Circular A-4 called for use of a 7 percent real (inflation-adjusted) discount rate. To evaluate government policies, the EPA previously has used 3 percent and 7 percent real discount rates to evaluate other environmental policies, such as those addressing air pollution. And, although the EPA discounted the estimated future health co-benefits associated with the CPP at 3 percent and 7 percent, it did not use those same discount rates to evaluate the benefits of CO2 reductions. Instead, as discussed below, the EPA used SCC values based on discount rates of 5 percent, 3 percent, and 2.5 percent to estimate the present value of CO2 reduction benefits. According to the EPA, the agency justifies using different discount rates for different types of benefits in the CPP “because CO2 emissions are long-lived and subsequent damages occur over many years.” This rationale makes little economic sense. For example, suppose that an environmental policy is forecast to impose an additional $10 billion of costs in 2050 and forecast to provide $10 billion in benefits in that same year. One cannot discount the costs at one rate and discount the benefits at a different rate because that would create an opportunity for unlimited arbitrage—in effect, an opportunity to create infinite wealth. That is impossible. None of the IWG reports calculating SCC values used a 7 percent discount rate, even though using that discount rate is called for in OMB Circular A-4. The rationale for not using a 7 percent discount rate, which is discussed in the IWG 2010 report, is convoluted and based on two different issues. First, IWG 2010 argues that wealthier individuals are more willing to pay for improved environmental quality. That’s generally true—an individual who is starving is unlikely to be willing to pay for a better view of the Grand Canyon or to save the snail darter. But studies of willingness to pay for improved environmental quality have focused on benefits received concurrently. In the case of CO2 emissions reductions, today’s generation is being asked to pay for an uncertain reduction in damages to future generations, who may be better off than we are today. The IWG statement about willingness to pay ignores this crucial difference. Second, the IWG argues that climate damages will be greatest when world wealth is greatest, stating that an upper-bound discount rate of 5 percent is included “to represent the possibility that climate damages are positively correlated with market returns.” But this means that, the wealthier future generations are, today’s generation ought to be correspondingly less willing to pay to reduce CO2 emissions for the benefit of future generations. In other words, the IWG’s rationale wrongly conflates future generations’ willingness to pay to avoid environmental damages with the fact that it is today’s generation that must actually pay. As such, the economic rationale for using a 7 percent discount rate, as called for by OMB Circular A-4, remains: the IWG’s selection of 3 percent as the appropriate discount rate is not justified. But even ignoring the failure to estimate SCC values using a 7 percent discount rate, the range of SCC values varies widely. As shown previously in Figure 6, using a 3 percent discount rate, the SCC values range from –$11/ton to $369/ton, depending on the scenario and model. At a 5 percent discount rate, the range narrows somewhat, from –$7/ton to $118/ton. Such broad ranges of SCC values, including negative values that imply that we should encourage greater CO2 emissions, provide little, if any, useful information for designing U.S. policy on CO2 emissions. 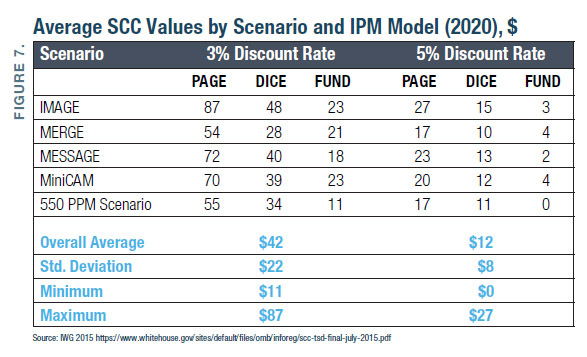 Because of the wide range of SCC values calculated by the three IPM models, the IWG (and hence the EPA) relied on the overall average of the SCC values calculated from the individual model estimates using different discount rates. For example, as shown previously in Figure 6, using a 3 percent discount rate, the FUND model calculated a range of SCC values under the IMAGE scenario of –$4/ton and $51/ton. The IWG used the average value of that modeling scenario, $23/ton, to develop the agency’s overall SCC value. As discussed previously, all the estimated SCC values are premised on scenarios projecting large changes in CO2 emissions from current levels of about 30 billion metric tons, from an increase to almost 120 billion metric tons in 2100 (MERGE) to a decrease to about 13 billion metric tons (550 ppm scenario). The 2015 IWG report’s SCC values are average per-ton figures reflecting these emissions changes, measured in many billions of tons, and the resulting changes in global economic well-being, measured in many trillions of dollars. But the CPP will not reduce CO2 emissions by many billions of tons. 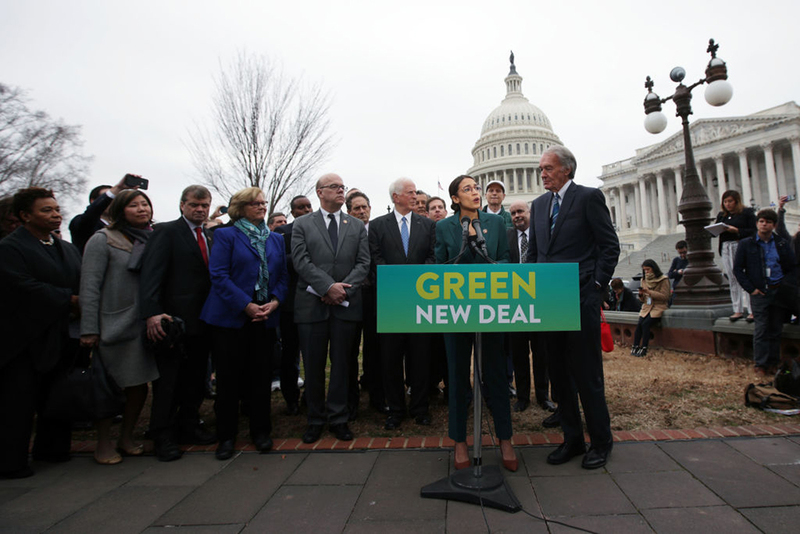 The CPP will reduce U.S. CO2 by 415 million tons per year in 2030—less than 7 percent below the forecast total of U.S. CO2 emissions of 5.5 billion metric tons (6.1 billion short tons) in 2030 and only about 1 percent of projected world CO2 emissions in that year. As such, the CPP is unlikely to have any statistically significant impact on global temperatures. In fact, independent analyses using the EPA-sponsored Model for the Assessment of Greenhouse Gas Induced Climate Change (MAGICC) estimate that the CPP will reduce the world’s average temperature between only 0.004◦C and 0.013°C by 2100, with an average reduction of 0.008°C. Changes in average global temperature of those magnitudes are far too small to be measured physically. Nor can such small changes be separated from natural climate variation. 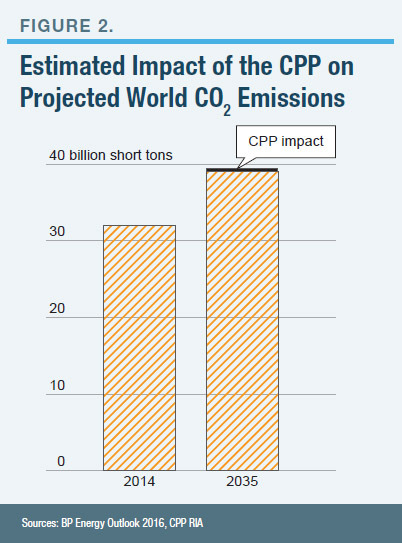 Thus, the projected CO2 emissions under the CPP reductions will have no measurable impact on world climate. And if those emissions reductions have no measurable impact on world climate, they will not have any measurable impact on world GDP, either. Quite apart from the inherently arbitrary assumptions in the various IPMs, the lack of any measurable physical impact from the CPP on world temperature and climate raises a straightforward and important question: If the CPP will have no measurable impact on world climate, how can the EPA nevertheless determine that the CPP will provide billions of dollars in climate benefits each year? To answer that question, two issues must be addressed. The first is a strategic issue, in which the EPA has treated implementation of the CPP in the context of a strategic, game-theoretic exercise. The second is a basic economic one: the difference between marginal and average values—and the EPA’s error in failing to distinguish between the two. From a strategic standpoint, the EPA argues that the U.S. must implement the CPP to persuade other countries to join efforts to reduce CO2 emissions, such as the recently signed Paris Agreement. Only if the U.S. takes the lead in adopting policies to address climate change, will other countries follow, the argument goes. One can think of this strategy as requiring U.S. citizens to absorb the costs of the CPP so as to convince other countries that they must do the same. This can be called a “leader-follower” strategy, although it differs from the traditional economic one, which has been typically applied to the behavior of oligopoly. In the case of the CPP, the EPA applies a leader-follower strategy to a presumed public good. Beyond the moral, ethical, and security issues this raises, there is a strategic foreign relations question. The United States is engaged in international negotiations in which U.S. emission reductions are part of a deal for abatement by other countries. Benefits to each country are determined by the global effort. Even if the U.S. government cares only about domestic impacts, this potential to leverage foreign mitigation supports a domestic SCC estimate augmented by the expected foreign leverage. Although this argument may appear reasonable, it ignores the alternatives and strategies available to other countries. Yet evaluating the strategies of other participants is a cornerstone of game-theory exercises. But nowhere does the EPA ever do this. For example, the EPA never evaluates the possibility that the U.S. implements the CPP and possibly other CO2 emissions policies; but other countries—especially China and India, which are the two largest CO2 emitters and whose emissions are rapidly increasing—do not reciprocate in kind. Furthermore, past experience with the 1998 Kyoto Protocol, which was also an agreement to reduce world CO2 emissions, suggests that the EPA’s assumed leader-follower strategy may not work. The reason is that the greater the actions taken by leaders, the greater are the benefits of free-riding by potential followers. In other words, the more the U.S. does to reduce its CO2 emissions, the more other countries will gain economically by not doing so. In effect, if the U.S. hobbles its economy by implementing the CPP, thereby raising the cost of electricity, along with the goods and services that use electricity as an input, other countries will gain a relative economic advantage. Of course, one might also argue that the multinational climate agreement signed in Paris in December 2015 (known as COP21, or simply the Paris Agreement) demonstrates that the EPA’s leader-follower strategy argument is valid. As part of the Paris Agreement, signatories have submitted “intended nationally determined contributions” (INDCs). For example, the INDC submitted by the U.S. commits the country to a reduction in overall CO2 emissions of between 26 percent and 28 percent below 2005 levels by 2025. The problem with this argument is that compliance with the Paris Agreement will be strictly voluntary. None of the INDCs is binding. Again, this means that the signatories to the agreement can free-ride by not meeting their voluntary CO2 emissions-reduction goals. As more countries commit to their specific INDC goals, and the greater the quantity of CO2 emissions are reduced by those signatories, the greater will be the benefits of free-riding by other signatories. Again, therefore, the EPA’s estimate of $20 billion in annual climate benefits by 2030 is overstated and unreasonable. While it is possible that moral suasion on the part of the U.S. will be effective—by having the CPP set an example for other nations—the lessons of the Kyoto Protocol and the benefits to other nations from free-riding on U.S. compliance suggest that this justification may amount to little more than wishful thinking. Finally, even if one assumes that all the signatories to the Paris Agreement meet their obligations, these commitments will have little impact on world temperature—only between 0.048 and 0.170 degrees Celsius by 2100. Again, it is not clear whether such small impacts can be physically measured or separated from normal temperature variability. Thus, even in the best of strategic circumstances, there will be few, if any, measurable climate benefits from implementing the CPP. Therefore, the EPA’s estimate of $20 billion in climate benefits is overstated and unreasonable. This paper next examines the EPA’s economic error stemming from its use of the IWG SCC values to estimate the direct benefits of the CPP from reductions in CO2 emissions. This economic error is a simple one: using average benefits to estimate a marginal one. To understand the difference, consider a health-related analogy. It’s generally recognized that regular exercise improves one’s health. Suppose that a study was performed comparing the health of individuals who walked three miles daily with those who did not exercise at all. The study estimated each walker’s health benefit at about $11,000 per year. Thus, the average benefit per mile walked is $11,000 / (three miles/day • 365 days) = $10/mile. But this does not mean that, if a couch potato walks 15 feet per day (roughly one mile each year), he will derive a $10 annual benefit, because the average benefit from walking is not the same as the marginal benefit. Yet this is exactly the type of error that the EPA has made in relying on average SCC values that were based on multibillion-ton changes in CO2 emissions, when the CPP will have only a small, marginal change on CO2 of less than 500 million tons. 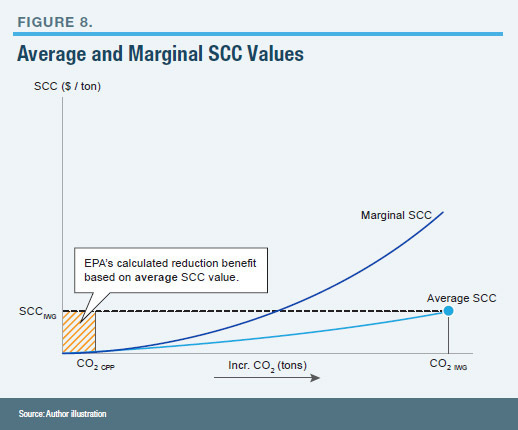 As with the couch potato, the EPA wrongly equated the average SCC values, estimated by the IWG from the three IPMs, with marginal SCC values (Figure 8). 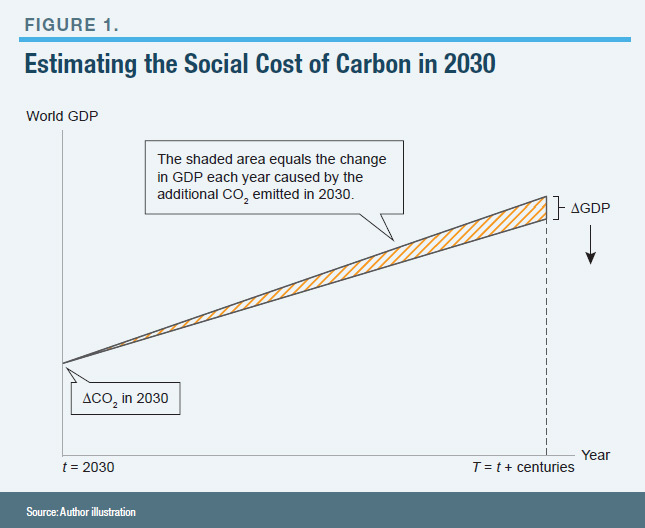 As shown in Figure 8, the marginal SCC is the economic impact of each additional ton of CO2 emitted. All the various climate models show increasing adverse impacts of greater CO2 emissions. 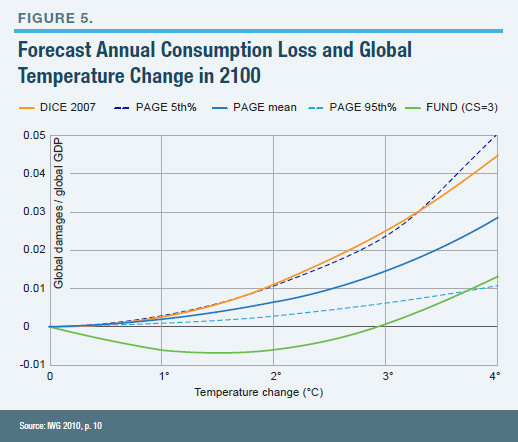 (As shown in Figure 5, even the FUND model projects this trend, once world temperature increases more than 3 degrees Celsius.) Thus, the marginal damage caused by increasing CO2 emissions is assumed by these models to increase, as shown by the curved line in Figure 8, labeled “Marginal SCC.” The average SCC value equals the total economic damage divided by total additional CO2 emissions. (The total SCC at any level of CO2 emissions equals the area under the marginal SCC curve. 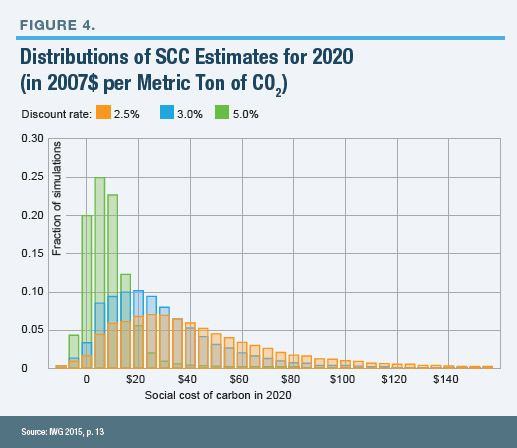 The average SCC equals the total social cost divided by the quantity of CO2 emitted.) If, despite the results of the FUND model, the marginal SCC is assumed to always be increasing, the average SCC curve always lies below the former, as shown. When the increase in CO2 emissions is small, the marginal damage is not even measurable. Equivalently, the marginal benefit of a small reduction in CO2 emissions is also small. This is the case with the CPP. Temperature changes that are too small to physically measure and impossible to separate from natural climate variability cannot be associated with changes in climate and economic output. Thus, the benefits of equivalent CO2 reductions are effectively zero. Again, however, the SCC values calculated by the IWG, and used by the EPA, are not based on marginal CO2 emissions changes. Instead, the SCC estimates are average values, equal to the estimated impact of a large change in CO2 emissions in a given year, divided by the present value of lost economic output, as measured by a decrease in world GDP. In Figure 8, the overall average value of the three models’ SCC values, as displayed in Figure 7, is shown as SCCIWG. Again, that is the SCC value that the EPA used to calculate the CO2 reduction benefits of the CPP. As discussed previously, the EPA estimated climate benefits in a given year by multiplying the CPP’s forecast reduction in CO2 emissions by the IWG’s SCC estimate for that year. In Figure 8, this is shown as the shaded rectangle, which equals the product of the estimated reduction in CO2 emissions, CO2 CPP, and the average SCC value, SCCIWG. But because the magnitude of CO2 reductions under the CPP is below the threshold level (assumed to be the level where there are measurable climate impacts), the CPP’s actual CO2 reduction benefits are effectively zero. In an attempt to get around the basic physical fact that the CPP will have no measurable impact on climate and thus no climate benefits, the EPA argues that, because climate change is a world problem, the SCC estimates must be based on world climate impacts. This is a typical public-good argument: no single party can capture all the benefits of a public good, which means that too little of that public good will be supplied. The argument is correct, as far as it goes, but the EPA misuses that argument. As discussed previously, factoring in world climate and economic impacts cannot change the fact that the CPP itself will have no measurable impact. Nor does it change the fact that, even justifying the CPP from a strategic standpoint, the overall estimated impacts of the Paris Agreement INDCs will also have little or no measurable effect on climate. The EPA estimated that 40 percent to 60 percent of the projected benefits of the CPP in 2030 will result from reduced particulate emissions, stemming from reductions in electricity supplied by coal-fired power plants. The EPA’s inclusion of co-benefits in its cost-benefit analysis of the CPP is consistent with its past practices. For example, the EPA’s analysis of its proposed Mercury and Air Toxics Standards (MATS) rule determined that more than 99 percent of the estimated benefits would be co-benefits from reduced particulate emissions. More recently, in EPA’s proposed rule to reduce ground-level ozone, two-thirds to three-fourths of the projected benefits in 2025 are co-benefits from particulate reductions. Clearly, accounting for co-benefits has been, and continues to be, a crucial component in the cost-benefit analyses that the EPA performs to justify its various rules. However, as this section demonstrates, not only are those estimates of co-benefits highly subjective and uncertain, but the EPA has almost surely double-counted some of those estimates, an outcome that arises because of other air-pollution rules that the EPA has implemented. The overwhelming majority of the estimated co-benefits in the CPP are the result of reductions in premature deaths (“premature mortality,” in the EPA vernacular). Although the EPA also estimates benefits from reduced sickness (“morbidity,” in the EPA vernacular), such as fewer heart attacks, asthma attacks, and so forth, these are small when compared with the benefits of premature deaths. The EPA’s estimated health co-benefits stem primarily from reductions in emissions of SO2 and NOx. The reason is that emissions of these two air pollutants cause (are “precursors,” in the EPA vernacular) increases in particulate levels and ground-level ozone concentrations. 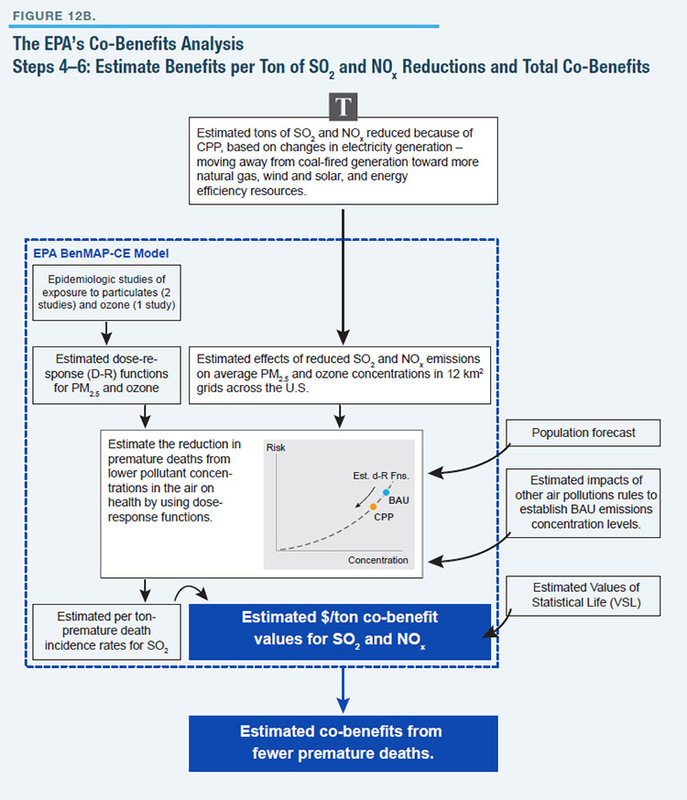 To estimate health co-benefits from reductions in SO2 and NOx, the EPA first estimated ranges of benefit-per-ton values for these pollutants for three regions of the U.S.: California, the West, and the East (Figure 9). The EPA performed similar, separate calculations for reductions in year-round and summer NOx emissions affecting particulate and ground-level ozone concentrations, respectively. As an example, using a 3 percent discount rate, the EPA estimated benefit-per-ton values for reductions in SO2 of between $40,000 and $89,000 in the East, between $7,800 and $18,000 per ton in the West, and between $120,000 and $270,000 per ton in California (Figure 10). The EPA derived benefit-per-ton values based on two epidemiological studies linking exposure to particulates to the risk of premature death and two studies linking exposure to ground-level ozone to premature death. The EPA used these studies to develop per-ton “incidence rates” for SO2 and NOx. These incidence rates were then combined with the EPA’s estimate of what is called the “value of a statistical life” (VSL). The overall SO2 and NOx benefit-per-ton values are the product of the incidence rates for each pollutant and the VSL. For example, the premature death incidence rates and per-ton benefit values for ground-level ozone caused by summer NOX emissions are shown in Figure 11. The regional values differ because of differences in population density; parts of California (e.g., Los Angeles), for example, have high population densities exposed to SO2. 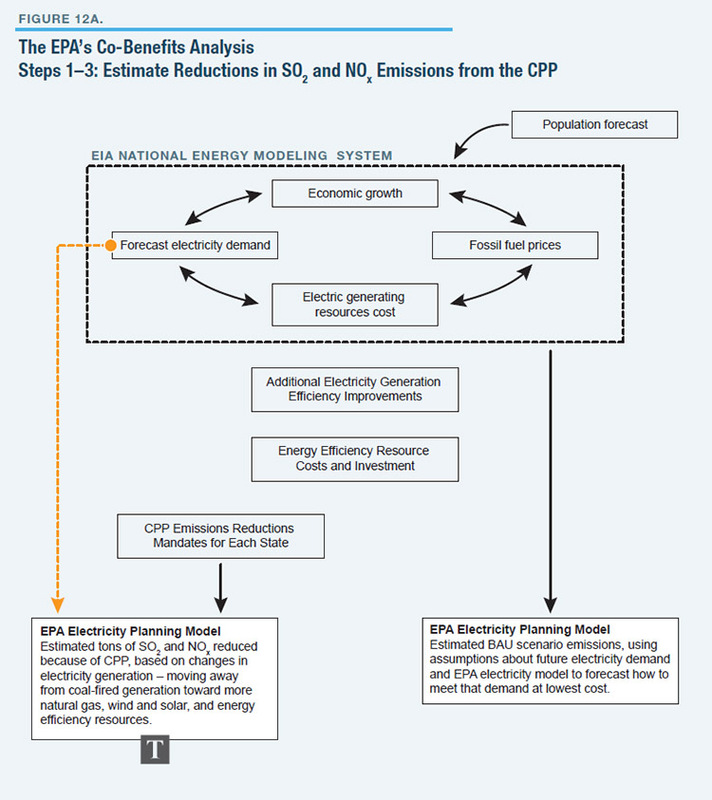 The EPA used its electricity planning model to determine the net reductions in SO2 and NOx reductions under the CPP from the business-as-usual (BAU) scenario. For example, the EPA determined that in 2030, the CPP would reduce SO2 emissions by 243,000 tons in the eastern U.S., 36,000 tons in the western U.S., and 1,000 tons in California, all below emissions in the BAU scenario. 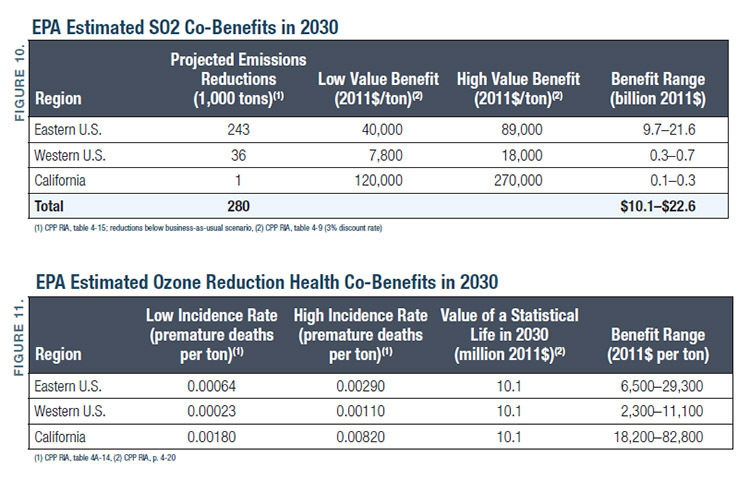 Thus, using a 3 percent discount rate, the EPA’s total health-related co-benefits from reduced SO2 in 2030 ranged from about $10 billion to nearly $23 billion, as shown in Figure 10. In effect, steps 1 through 3 provide estimates of the total reductions in pollutant emissions, measured in tons, while steps 4 through 6 estimate the average values per ton for those emissions reductions. The EPA performed the calculations for three years: 2020, when the CPP is assumed to take effect; 2025; and 2030, the year when the EPA expected the CPP to be fully implemented. Figures 12a and 12b provide a simplified schematic of the co-benefits analysis process, involving multiple models and assumptions, which, as discussed below, are not consistent with one another. As shown in Figure 12a, steps 1 through 3 produce the estimated reductions in SO2 and NOx, measured in tons. (This is shown as the box labeled “T.”) The EPA uses an exogenous forecast of electricity demand produced by the U.S. Energy Information Administration (EIA)—specifically, the forecast published in the EIA Annual Energy Outlook 2015, which projects electricity demand through the year 2040. That forecast is produced using EIA’s National Energy Modeling System (NEMS), which simultaneously forecasts energy demand, fuel prices, and economic growth. Using the projections of emissions reductions, the EPA employs a computer model, called the Benefits Mapping and Analysis Program—Community Edition (BenMAP-CE),89 to estimate the corresponding reductions in air quality throughout the country. BenMAP-CE breaks the country into 12 km2 grids because the health impacts from exposure to pollutants, such as those emitted by a coal-fired power plant, depend on how far an individual lives from the plant. BenMAP-CE estimates the value of the health benefits from the reduced exposure levels to PM2.5, based on the results of two epidemiological studies that evaluated the relationships between levels of particulate matter concentrations and exposure to mortality risk (Figure 13). Next, the EPA estimated the monetary value of the reduction in premature deaths. To do this, the EPA used an estimated value of a statistical life (VSL). VSLs are commonly estimated based on studies that compare wage rates in different occupations and those occupations’ risks of fatal accidents or through contingent valuation studies, which are based on surveys. For example, ironworkers who build skyscrapers have a higher risk of accidental death than construction workers who build single-family homes. Not surprisingly, ironworkers are paid more than construction workers. The differences in accident risk and wages can be used to estimate the statistical value of life. The EPA developed an average VSL value of $6.3 million (in 2000$), based on the results of 26 labor-market and contingent valuation studies conducted from 1974 through 1991. The EPA also assumed that VSL numbers would increase as growth in income increases, and thus used VSLs of $9.9 million (2011$) in 2020 and $10.1 million (2011$) in 2025 and 2030. The EPA combined the estimated decreases in premature deaths with the VSL to determine the overall co-benefits of air-pollution reductions. 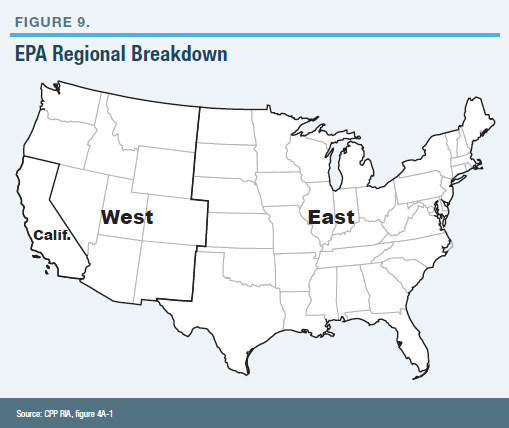 The EPA then aggregated the local emissions-reduction benefits estimated by BenMAP-CE into dollar-per-ton estimates for three regions: California, the eastern U.S., and the western U.S., as shown in Figure 9. Those estimates, combined with the estimated reductions in premature deaths in each region, provide the overall co-benefits estimates associated with reductions in particulates and ground-level ozone in the three analysis years. The estimated pollution reductions are determined using the EPA’s integrated electric planning model (EPM). That model, which is also used to determine the cost of meeting future electricity demand under the CPP, determines the optimal (i.e., least-cost) mix of generating resources to meet future electricity demand while also meeting the required individual state CO2 emissions reductions. The EPM is a deterministic model: the model assumes that the future is known with perfect certainty. That assumption is an obvious simplification of reality and one that creates a downward bias in compliance costs, as discussed later. But even if one ignored that source of cost bias, the EPA’s use of the EPM to estimate changes in total particulates and ground-level ozone ignores the fact that higher electricity costs will affect economic growth and the economic viability of other large industrial sources of these pollutants. For example, as electricity prices increase, some industrial and commercial sources may reduce or relocate their operations to lower-cost venues, or even go out of business altogether. But the EPM does not take this into account, as the model focuses solely on meeting electricity demand. A second source of potential bias in the EPA analysis, which likely overestimates pollution reductions, stems from the EPA’s assumption about improvements in the operating efficiency (called the “heat rate”) of the coal-fired generating units that continue to operate under the CPP. More efficient coal-fired plants result in fewer emissions for every MWh of electricity generated. For example, the EPA assumes that coal-fired generating plants in Texas will increase their average efficiency by 2.3 percent by 2030, while those in the eastern U.S. will increase efficiency by an average of 4.3 percent, all at a cost of $100/kW, based on a break-even analysis between efficiency improvements and the cost of coal. Although assumptions about improved operating efficiency over time are reasonable, the EPA analysis assumes that no such heat-rate improvements will take place under its BAU case. But that assumption is belied by the steady improvements in generating efficiency that have taken place for decades. Gas-fired combined-cycle generating technology, for example, has improved greatly over the past decades. (Furthermore, as discussed in the section on compliance costs, this assumption introduces downward bias in the compliance cost estimates.) The EPA never explains why, under its base case, there are no assumed heat-rate improvements. Moreover, the EPA assumption is contradicted by other aspects of the EPM, such as forecast decreases in average operating hours of coal-fired plants, which will reduce the operating efficiency of those plants. And the EPA analysis ignores how uncertainty about future coal prices affects economic decisions by owners of generation plants. In making its heat-rate improvement assumptions based on break-even analysis (evaluating the minimum return necessary to induce new investment), the EPA also appears to have not accounted for existing pollution-control requirements—specifically, those under the agency’s own New Source Performance (NSP) rules. Under NSP, heat-rate improvements such as those assumed by the EPA can trigger requirements for additional pollution-control measures. For example, if the owner of a coal-fired generating plant installs a new, more efficient, boiler, doing so could trigger NSP rules, requiring the owner to install additional pollution-control equipment. From an economic standpoint, such a trigger reduces the incentive to install the more efficient boiler. There is no evidence that the EPA accounted for this basic economic issue. A third source of potential bias in the EPA analysis stems from the electricity demand forecast itself. Specifically, for its analysis, the EPA relied on the forecast of electricity demand prepared by the EIA, using that agency’s NEMS, discussed earlier. The electricity demand forecast produced by NEMS is based on numerous factors, including future economic growth and fuel prices. Moreover, NEMS is dynamic, in that economic growth, future fuel prices, and electricity demand are determined simultaneously because they all affect one another. The EPM, however, assumes a rate of future economic growth that is independent of electricity and fuel prices, thus ignoring the interdependence built in to the EIA’s modeling system, which is an input to Step 1 of the six-step estimation process described previously. Thus, for example, whereas the EIA’s 2015 Annual Energy Outlook predicts rising real prices of natural gas over time, the EPM forecasts lower natural gas prices under the CPP. Because fuel prices affect economic growth, the forecast economic conditions used by the EPM as inputs are inconsistent with NEMS. Yet the EPA model relies on NEMS for forecasts of future electric demand and economic growth. Moreover, as was discussed previously, the EPA links the benefits of the CPP to assumptions about world economic activity, population growth, and implementation of similar CO2 reduction programs in other countries. This introduces another modeling inconsistency if SCC estimates are based on a projection of future world economic growth—including projections of U.S. economic growth—that differs from the assumptions used in the EPM. The estimated benefits from reductions in premature death are based on extrapolations of estimated historical relationships between exposure to pollutants and the rate of death and disease using epidemiological studies, as well as estimates of the value of a statistical life. The estimated benefits from forecasts of reduced disease incidence, such as asthma attacks, are also based on epidemiological studies, but typically rely on assumptions about the costs of illness, such as the estimated cost of a doctor visit or a missed school day, to determine overall benefits estimates. 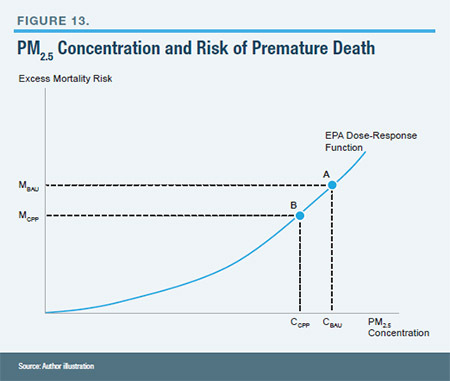 Because the overwhelming majority of the EPA’s estimated co-benefits under the CPP stem from projections of reduced premature deaths, the discussion in this section focuses on those estimates. Of all the EPA’s projected benefits of the CPP, the assumptions and analysis underlying the estimates of co-benefits resulting from reductions in premature deaths are perhaps the most complex. The EPA’s benefit-per-ton estimates for reductions in PM2.5 and premature mortality in adults are based on two studies: Krewski et al. (2009) and Lepeule et al. (2012). Neither study “proves” causation between exposure levels and increased mortality risk; instead, they demonstrate correlations between exposure levels and premature deaths. That is not unusual, as the science of epidemiology focuses on observations between diseases in populations and exposure to different elements. Because these two studies are so integral to the EPA’s co-benefits estimate of reductions in particulates, it helps to know a little more about them. In addition to exposure levels, the original study collected demographic data, such as education and income levels, employment status, race, and whether the individuals lived in homes with air conditioning, based on the 1980 census. The study evaluated the links between particulate exposure levels and different causes of death, such as heart attacks, lung cancer, and so forth, and estimated changes in risk associated with 10-microgram-per-cubic-meter (µg/m3) changes in PM2.5 concentration levels. The study found that the risk of premature death increased by between 3 percent and 15 percent for each 10 μg/m3 increase in PM2.5. The study also found a strong inverse correlation between education levels and mortality risk: less-educated individuals were found to have greater risk from premature death from PM2.5 exposure than individuals with more education. Although not as detailed as the Krewski analysis, the Lepeule et al. study found similar risk increases for each 10 μg/m3 increase in PM2.5. Although that study used data as far back as 1979, data from the EPA were available only for 1999–2009. Pre-1979 data were assumed equal to the first year when concentration was measured. Data for 1988–98 were estimated based on concentrations of larger particulates (PM10) and visibility measures from the National Weather Service. The Lepeule study estimated a log-linear relationship between PM2.5 levels and premature mortality down to the lowest measured concentrations of 8 µg/m3. The critical issue is that estimating a log-linear relationship (or any relationship) between observed exposure levels and excess mortality risk does not mean that same relationship continues below observed exposure levels. Yet that is exactly what the EPA assumed in estimating the co-benefits of the CPP. If concentrations nationwide are nearing the lowest measured levels of the epidemiological studies, simply extrapolating results to unobserved levels to estimate benefits at lower concentrations can lead to a biased estimate of the dose-response function and overestimate the benefits of further reductions in concentrations. In other words, if there are (unobserved) concentration levels that are ignored in estimating the dose-response function, there may be no impacts whatsoever beyond a given threshold concentration level (Figure 14). In this figure, the large black dots represent observed PM2.5 concentrations and relative risk values. These are fit with a regression to derive an estimated log-linear dose-response function over the range of observed PM2.5 concentrations, down to the minimum observed level (the dashed black line). The key empirical question, however, is what the dose-response function looks like below the minimum observed concentration levels, especially as the EPA’s maximum nationwide concentration limits are close to the lowest observed concentrations in these studies. The solid blue line represents the “true,” but unobserved, dose-response relationship. 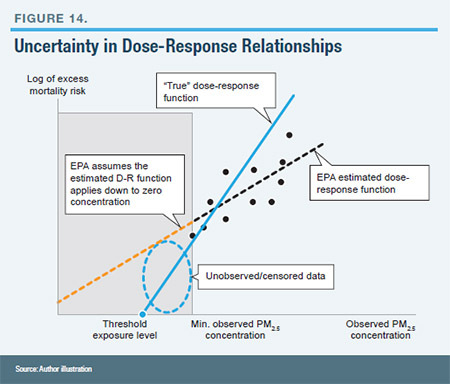 While admitting that there is a great deal of uncertainty in estimating dose-response relationships, the EPA assumes that the dose-response function is log-linear until a zero concentration is reached (the dashed orange line); that is, the EPA assumes that there is no threshold exposure level. In contrast, in some of its previous studies, the EPA did assume that there were threshold exposure levels below which there were no additional benefits. The EPA’s estimated benefit-per-ton values for reductions in ozone concentrations are equally problematic. Again, the EPA assumes that there are no threshold levels of ozone concentrations below which there are no adverse health impacts, i.e., there is no safe level. Yet in a recent article, Goodman et al. (2015) question whether the EPA’s proposal to lower maximum ozone exposure levels would provide additional health benefits. The authors of this article discuss the many factors that enter into epidemiological studies of ozone exposure, such as average exposure times, errors in measuring exposure levels, errors in distinguishing other factors affecting risk, and so forth, concluding that: (i) the EPA has failed to address these methodological issues in its recommendations for more stringent ozone exposure standards; and (ii) had the EPA done so, the proposed lower standards would not improve health. Uncertainty/Bias 3: Has the EPA Double-Counted Air-Pollution Reduction Benefits? Critics of the CPP contend that the EPA is double-counting co-benefits that the agency has previously included in other air-pollution regulations. Moreover, critics also argue that the EPA’s setting of standards for other air pollutants has raised a related problem: because it is required to set standards at levels where there is no significant risk from pollutant exposure, the agency is double-counting health co-benefits from emissions reductions beyond those standards. The EPA asserts that it has not double-counted benefits, and instead claims that the agency has estimated the incremental benefits of additional particulate reductions. For example, the EPA claims that the “estimated benefits associated with these emissions reductions are beyond those achieved by previous EPA rulemakings, including the Mercury and Air Toxics Standards (MATS).” Moreover, the EPA also claims that incremental benefits can be achieved by reducing pollution levels below those established by the agency’s own standards. But MATS has not been implemented and still faces legal challenges. Thus, assumptions made by the EPA for how electric generators will comply with MATS are just that—assumptions, which adds to the uncertainty of the pollution-reduction estimates in the CPP RIA. The same is true of the EPA’s recent Cross-State Air Pollution Rule (CSAPR), which took effect in January 2015. According to the EPA, this rule has also been incorporated into its CPP analysis. Therefore, one can ask whether—and, if so, how—the EPA has incorporated CSAPR compliance into its pollution-reduction estimates. Similarly, it is not clear whether the EPA’s cost-benefit analysis of its even more recent proposed rule to further reduce ground-level ozone concentrations—which also projects significant air-pollution co-benefits from decreased particulate emissions—incorporates all the changes from the CPP. In part, the critics’ arguments are correct. Clearly, if the EPA counts the benefits of a reduction in pollution for Rule A, then the agency cannot count those same benefits for Rule B. As I discuss below, whether the EPA has done so in the CPP is unclear. But the argument also reflects a fundamental disagreement over health-based pollution standards themselves: if health-based standards are set at levels where there is supposedly little risk to human health, can further reductions in those levels provide additional health benefits? In other words, is there a threshold level beyond which there are no additional adverse impacts from exposure? A further complication arises because, as discussed previously, epidemiological studies are not evidence of causality. Even though such studies attempt to account for other contributing factors, including smoking, they cannot “prove” that exposure to, say, particulates will cause an individual to suffer an asthma attack or die of lung cancer prematurely a given number of years into the future. Some of the emissions reductions estimated to result from implementation of the final emission guidelines may achieve some of the air quality improvements that resulted from the hypothesized attainment strategies presented in the illustrative NAAQS RIAs. The emissions reductions from implementing the final emission guidelines will decrease the remaining amount of emissions reductions needed in non-attainment areas and reduce the costs and benefits attributable to meeting the NAAQS. Although laced with more bureaucratese, this statement also suggests that some of the estimated co-benefits may be double-counted. When the Final CPP RIA was released in August 2015, the EPA had not yet issued a Regulatory Impact Analysis for the agency’s proposed new ground-level ozone standards (Ozone RIA), as part of the NAAQS. The proposed standard would reduce the maximum ground-level ozone exposure from the current 75 parts per billion (ppb) to 70 ppb. According to this latest ozone RIA, between two-thirds and three-fourths of the projected benefits in 2025 are particulate reduction co-benefits. Thus, it seems reasonable to conclude that there is some level of double-counting of co-benefits in the CPP RIA. Precisely how much double-counting is impossible to determine, partly because of the nature of the EPM, which the EPA used to estimate the benefits associated with pollution reductions under the CPP and has also used to evaluate pollution reductions in the electric generating sector associated with other air-pollution rules. Determining whether the EPA has double-counted the same pollution-reduction benefits rests on the EPA’s integrated electric planning model, which, through its assumption of perfect knowledge about the future, determines whether the owners of individual generating units will respond to each pollution rule. For example, in assuming MATS compliance by 2016, the model determines which coal-fired generating plants would be shuttered because of a physical or a financial inability to comply with the emissions reductions. The model also determines investment in new generating plants and energy efficiency to meet future electricity demand. Those plant closures and new additions then determine the estimated co-benefits from particulate and ozone reductions. Similarly, to meet the CPP, the EPA electric planning model again determines which of the remaining coal-fired generators will be shuttered, what new plants will be constructed, and the level of energy-efficiency investments needed to meet future electricity demand, and so on, for the proposed ozone rule. Because of the nature of how owners would look at multitudes of air-pollution rules simultaneously, as well as the uncertainty of the impacts of those rules, it is virtually impossible to separate the effects of each rule on investor decisions. That is, if a generation-plant owner is confronting future implementation of multiple air-pollution rules, the owner likely will evaluate a plant’s economic future based on the rules in total, not separately. Ultimately, while it may be impossible to demonstrate that the EPA has double-counted a specific quantity of pollution reductions—such as showing the same coal plant being closed multiple times under different rules—the limitations of the EPA’s planning methodology and its treatment of future investment decisions make it virtually impossible not to double-count pollution reductions from separate rules. The compliance costs associated with the CPP focus primarily on the additional costs of meeting future electric demand. (The EPA also estimated reporting and record-keeping costs, but these are several orders of magnitude lower.) The EPA estimated the difference in costs between a BAU future that meets demand but that does not include the individual state CO2 reduction goals, and a case in which demand and each state’s CO2 reduction goals are simultaneously met. The EPA calculated the difference in compliance costs associated with meeting forecast electricity demand under its base case and CPP model scenarios. As shown previously in Figure 12a, the EPA’s forecast of future electricity demand is based on the forecast published in the EIA’s 2015 Annual Energy Outlook. For example, in 2020, the AEO forecasts total electricity demand of about 4 million GWh, after accounting for energy-efficiency programs. Using this forecast, the EPA used its integrated electric planning model to determine the lowest-cost mix of generating resources to meet that demand, based on forecasts of technology costs and fuel prices in three separate years: 2020, 2025, and 2030. For example, in 2020, the EPA’s BAU scenario assumes 207,000 MW of installed coal-fired generating capacity in the U.S., 100,000 MW of nuclear capacity, and 130,000 MW of non-hydroelectric renewable generating capacity, primarily wind and solar generation. Next, the EPA estimated the cost of meeting this same level of electricity demand under the CPP. To do this, the EPA first reduced forecast demand by the amount of additional cost-effective energy-efficiency resources that would be acquired in each state. The EPA then ran its electricity planning model to determine the lowest-cost mix of generating resources to meet these lower-demand values in 2020, 2025, and 2030. The total change in meeting electricity demand in those three years is the net difference between the reduced cost of generating electricity and the cost of the additional energy-efficiency investments. The EPA estimated that, by 2030, the total increase in compliance costs over the base case would be between $5.1 billion and $8.4 billion, depending on whether the individual state CO2 reduction goals are achieved through mass-based reductions or rate-based ones, respectively. For example, in 2030, the EPA estimated total generating cost under the BAU scenario of $201.3 billion (2011$) and a generating cost of $180.1 billion under the CPP. Thus, under the CPP, the EPA forecasts a reduction in generating costs of $21.2 billion (2011$). To this value, the additional cost of energy efficiency is added. In 2030, the EPA’s estimate of additional energy-efficiency expenditures is $26.3 billion. Thus, the net increase in meeting electricity demand is about $5.1 billion (2011$). The EPA analysis is based on numerous assumptions, many of which are unreasonable and artificially reduce projected compliance costs. A number of these assumptions appear to be arbitrary, while other assumptions are inconsistent with the EPA’s own analysis. Furthermore, the EPA’s electricity planning model is deterministic (i.e., it assumes perfect foresight). Of course, in reality, the future is uncertain, and the further out into the future one goes, the greater the uncertainty. This is why long-term forecasts tend to be inaccurate. Moreover, investment decisions, including decisions about the types of generation to construct and the amounts of energy-efficiency resources to obtain, will also be affected by uncertainty. But the EPA ignored those effects on investment decisions. Even if the EPA’s cost analysis were valid, the comparison between the additional costs of meeting future electricity demand and the benefits from CO2 reductions and air-pollution reduction co-benefits violates a fundamental tenet of benefit-cost analysis: the cost and benefit estimates for a policy must be calculated using a consistent perspective. For example, suppose a proposed policy in New York State will impose $10 million in costs to New Yorkers and $90 million in costs to the rest of the U.S. Suppose further that the policy will provide an estimated $50 million in benefits to New Yorkers and $40 million to the rest of the U.S., or $90 million in total benefits. A policy that provides $90 million in benefits to the U.S. but imposes $100 million in costs is not one that passes benefit-cost muster. Next, suppose that New York policymakers base their decision to implement the policy on comparing the costs and benefits accruing to the state alone. In that case, they would compare $50 million in benefits and $10 million in costs. Now the policy appears to be favorable from a benefit-cost standpoint. Finally, suppose that New York policymakers compare the costs to the state and benefits to the nation as a whole. In that case, the policy appears even more favorable: costing $10 million, it provides $90 million in benefits. The problem is that evaluating the proposed policy using either of these two alternative frameworks (state costs and state benefits; state costs and national benefits) produces a distorted picture. In effect, these two frameworks completely ignore the “beggar-thy-neighbor” impacts of the proposed policy on the rest of the U.S. The interconnected nature of the world economy is clearly true. Yet on the cost side, the EPA ignored all those broader economic impacts—notably, potential reductions in future U.S. GDP growth resulting from higher electric costs and the impact of changes in future U.S. economic growth on the world economy. In so doing, the EPA limited its cost estimates to changes in the future cost of electricity to U.S. consumers. This dichotomy between how the EPA measured benefits and costs—in effect, an apples-to-oranges comparison of benefits and costs—is a fundamental flaw of the CPP RIA. The CPP RIA’s treatment of energy efficiency suffers from fundamental flaws typical of engineering-economic analyses of energy-efficiency programs, which typically overestimate energy savings and underestimate costs. Moreover, the analyses fail to account for rebound (or “snapback”) impacts, in which consumers, seeing lower costs to obtain the services that electricity provides (e.g., air conditioning), consume more of those services. This is similar to the effect of owning a car with a high number of miles per gallon: the greater the MPG, the lower the cost to drive. As the per-mile cost to drive falls, the number of miles driven tends to increase. This type of behavior, which stems from basic economics, can be difficult to observe empirically for many electricity consumers because most consumers do not have electricity use metered by each end use. Although the EPA recognizes the existence of rebound effects, the agency’s energy-efficiency analysis does not account for them and instead dismisses those effects as insignificant. The EPA assumed that electricity demand in each state would decrease each year because of new energy-efficiency programs implemented under the CPP. For example, if a state was estimated to have been reducing electricity demand by 0.4 percent annually, the EPA assumed that this rate of reduction would not only continue under the CPP but would ramp up by 0.2 percent each year, until the reduction in electricity demand in each state was 1.0 percent per year by 2020. The EPA then assumed that this 1.0 percent annual reduction would continue throughout the remainder of the modeling period (i.e., until 2030). As a result of these assumed energy-efficiency gains, the EPA assumes that total electricity demand is almost 8 percent lower by 2030 than in the base case. The EPA never explains why none of these programs would be implemented but for the CPP, especially given the EPA’s arguments regarding the cost-effectiveness of these programs. Given the small estimated changes in electricity rates forecast by the EPA, it is not clear why, if these energy-efficiency programs are so cost-effective, none would be implemented absent the CPP. Thus, the EPA analysis overestimates potential energy savings, and the resulting reductions in electricity generation, compared with the base-case scenario. Furthermore, the compliance costs calculated by the EPA through its electricity planning model used still another real discount rate to determine the costs of future generating-plant investments. This rate, 4.77 percent, reflects the EPA’s estimate of the weighted average cost of capital for generation developers. However, the EPA used discount rates of 3 percent and 7 percent to determine cost-effective energy-efficiency investments. In effect, the EPA analysis assumes private investment decisions for generating plants but societal investment decisions for installing energy-efficiency measures, even though installing energy-efficiency measures is done by private individuals and firms with private capital. Whereas economists (and others) may argue about the most appropriate discount rates to apply to environmental policies, there is no justification for using different rates in discounting different benefit and cost streams arising from the same policy. Again, doing so creates the potential for infinite arbitrage, which is impossible. The EPA also significantly underestimates energy-efficiency costs because of another fundamental economic error. This error stems from the EPA’s spreading out the costs of energy-efficiency investments (called “levelization”) over assumed lifetimes, rather than incurring the costs of the investments in the year when they are made. A simple example can illustrate the difference. Suppose that you go to the hardware store and purchase a new LED bulb for $30. Although the bulb may last ten years, the $30 purchase cost is not spread out over ten years. Rather, you incur the cost when you purchase the bulb, even though you may obtain benefits from the bulb, in the form of a lower electric bill, over the bulb’s lifetime. A cost-benefit analysis of your lightbulb purchase would compare the up-front cost against the present value of future benefits. The EPA did not do that. Instead, by annualizing energy-efficiency investment costs and preparing estimates for only three analysis years, the EPA significantly understates the actual costs of energy-efficiency programs, including the costs paid by consumers themselves. This assumption significantly understates the actual costs of the assumed energy-efficiency investments, especially as the EPA does not provide any sort of overall present value cost analysis. Rather, the EPA simply provides cost “snapshots” in 2020, 2025, and 2030. The EPA’s assumption also understates the adverse impacts on lower-income consumers, who will be less likely to afford the energy-efficiency investments forecast by the agency. Moreover, by understating energy-efficiency costs, the EPA’s forecasts of lower electric bills for residential consumers, which project average reductions of between 7 percent and 8 percent by 2030, are also dubious. Another set of issues in the EPA analysis concerns the costs and output of wind and solar generation. Specifically, the EPA assumes aggressive cost reductions for onshore wind and solar photovoltaic generation and may also overestimate the actual generation of those resources. These assumptions serve to reduce forecast compliance costs. The EPA projects the addition of about 90,000 MW of new non-hydro renewable generating capacity by 2030 under the CPP, a doubling of the estimated non-hydro renewable generating capacity in 2013 (Figure 15). In total, the EPA projects 154,000 MW of non-hydro renewable generating capacity in 2030 in its base case and an average of 172,500 MW under the CPP. By comparison, in 2013 total non-hydro renewable generating capacity was 88,300 MW, of which more than 66,000 MW was from wind and solar generation. Because of their inherent intermittency, actual generation from wind and solar facilities is only a fraction of the amount of installed capacity. In 2014, the average capacity factor for utility-scale wind generation (i.e., what was actually produced) was 34 percent. The capacity factors for solar photovoltaics and solar thermal were 26 percent and 20 percent, respectively. The EPA analysis assumes, without any supporting evidence, that these capacity factors will increase steadily over time. For example, the EPA assumes that the capacity factors for new onshore wind generation will increase to between 39 percent and 44 percent, depending on location. 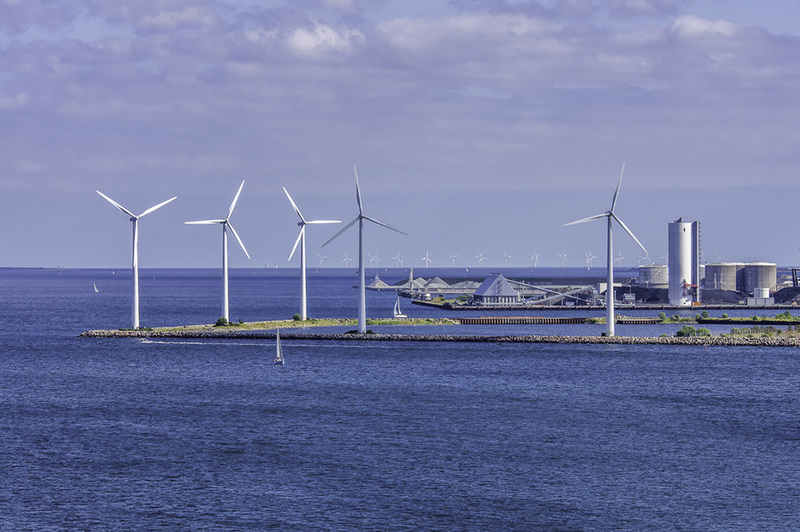 For offshore wind generation, the EPA assumes capacity factors between 43 percent and 53 percent, depending on location. [149 Moreover, the generation profiles used by the EPA for solar photovoltaics show solar power being generated in some states as early as 4 am in winter (hours before sunrise) and throughout the night in summer. Although the overall impact on compliance costs from these assumptions is likely small, they demonstrate, at the least, sloppy modeling. In addition to doubling the amount of wind and solar capacity, the most recent version of the EPA cost model (v.5.15), which the agency used to estimate generating costs to meet future demand, assumes significant decreases in the capital and fixed operation and maintenance (O&M) costs for new wind and solar generating capacity as of 2016, relative to the previous iteration of the model (v.5.13) (Figure 16). 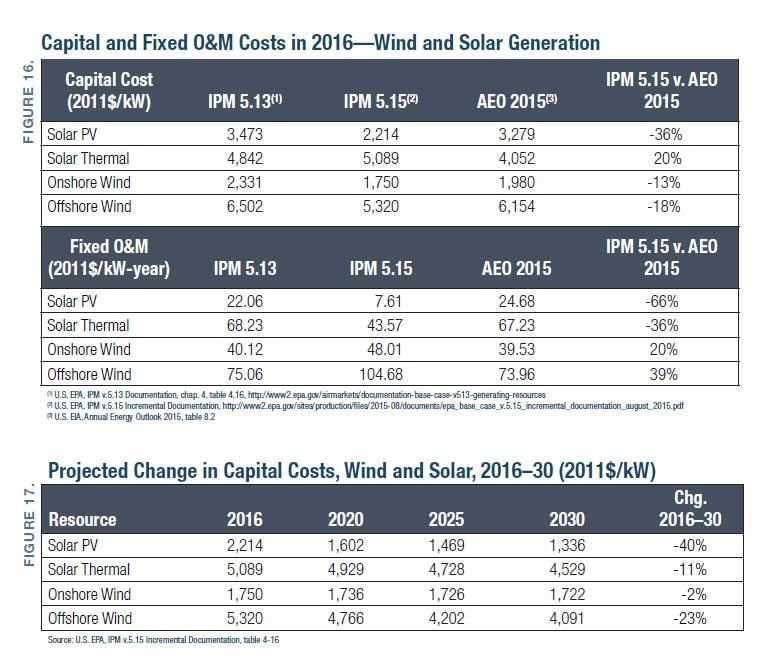 The IPM also forecasts continued decreases in capital costs of wind and solar generation, especially for photovoltaics and onshore wind (Figure 17). Taken together, the EPA’s projected cost reductions and increased capacity factors paint a highly optimistic picture for the cost of wind and solar under the CPP. Of course, these cost and availability projections cannot be disproved; they are, after all, projections. But economic considerations suggest that the projections are overly optimistic, for several reasons. First, wind generation already has been developed extensively where the wind is most favorable and wind resources generate the most electricity. Such locations provide wind developers with the highest profits. As more wind generation is added, development is likely to occur in areas with less favorable wind conditions and less generation. Thus, rather than continual increases in wind capacity factors, as forecast by the EPA, it is more likely that new wind resources will have lower capacity factors. Second, the Wind Production Tax Credit (PTC), which has driven new wind development, expired at the end of 2014. Although the tax credit was resurrected through 2019 as part of reaching a federal budget agreement at the end of 2015, the resurrection entails a phaseout of the Wind PTC in that time, with the level steadily decreasing. As such, the economics of new wind generation will be less favorable than if the full PTC were available. Finally, the EPA analysis does not consider the need for new transmission infrastructure to connect the forecast investments in new wind and solar generating capacity. Nor does the EPA model include the additional cost of standby operation of fossil-fuel generation, primarily gas-fired combined-cycle generating units, which must provide backup to “firm up” intermittent wind and solar generation. Exclusion of these two types of costs introduces a downward bias in the EPA’s compliance cost estimates. Ultimately, the EPA’s justification for the CPP is based on strategic and foreign policy assumptions, specifically, that the U.S. must go first—and U.S. citizens must pay—if any worldwide agreement on reducing carbon dioxide emissions is to be achieved. Yet even in the wake of the Paris Agreement in December 2015, there is no evidence that other nations—especially the two with the largest and rapidly increasing CO2 emissions, China and India—will respond in kind. The fundamental question addressed in this paper is whether the EPA’s cost-benefit analysis provides a reasonable and factual basis to conclude that the CPP’s benefits will exceed its costs. To this question, the answer is clearly no. The EPA’s cost-benefit analysis relied on multiple layers of unrealistic, arbitrary, and inconsistent assumptions. The EPA overestimated the primary benefits associated with reduced CO2 emissions because it relied on an arbitrarily calculated average SCC and used that average value, rather than a marginal value, to estimate worldwide economic benefits, 90 percent of which will not be realized by U.S. consumers. And, contrary to the requirements of OMB Circular A-4, EPA does not separate CO2 reduction benefits accruing outside the U.S., even though the vast majority of the estimated benefits will, in fact, accrue outside the country. In effect, the CPP will require U.S. consumers, businesses, and taxpayers to incur billions of dollars in higher costs each year for their electricity (along with the ripple effects that higher electricity prices will have on other goods and services) in exchange for CO2 reductions that will have no measurable impacts on world temperature and climate. The EPA analysis overestimated health co-benefits by overestimating pollution reductions stemming from unrealistic assumptions about operating-efficiency improvements of coal-fired power plants, failing to account for possible threshold impacts of pollutant exposures and treating all forecast deaths from air-pollution exposure as “premature.” The EPA’s modeling approach also appears to double-count co-benefits, although the flawed electricity demand modeling process used by the EPA makes it virtually impossible to determine the exact magnitude of that double-counting. The EPA also underestimated compliance costs by: (i) annualizing energy-efficiency investments, rather than accounting for the costs that would actually be paid by electric consumers; (ii) ignoring rebound effects; (iii) using optimistic assumptions about wind and solar costs and output; and (iv) ignoring the costs of new transmission infrastructure that will be necessary to connect the projected doubling of wind and solar generation under the CPP, as well as the costs of additional backup generation needed to offset the intermittency of wind and solar generation. Beyond these analytical errors, the EPA analysis suffers from a fundamental apples-to-oranges error because it compares electricity-related costs borne by U.S. consumers with global economic benefits. That error alone means that the EPA analysis is not a reasonable basis for justifying the CPP in terms of forecast benefits and costs. Finally, the EPA never considers the equity issues that will flow from higher retail electricity prices and how those higher prices are likely to exacerbate energy poverty, especially in states where current environmental policies have caused retail electric rates to increase. Exacerbating energy poverty through higher electricity costs and reduced economic growth is likely to expose lower-income consumers to greater health risks. Ultimately, the EPA views the CPP in a strategic context, arguing that the CPP must be implemented if other nations are to implement their own CO2 reduction policies. Whether that view is correct is unknown, although jumping off a cliff and hoping that others will follow may not be an effective strategy to address climate change. But the EPA never considers the economic implications if its view is wrong and if implementation of the CPP does not lead to other nations imposing their own CO2 reduction policies. Again, the recent Paris climate accord is strictly voluntary. Development of optimal climate-change policies—including whether an optimal policy is to do nothing specific to reduce future CO2 emissions—depends on many factors, not the least of which are highly uncertain computer models. But such policies also hinge on attitudes toward future risks, whether society must purchase “insurance” against those risks, and, if so, how much insurance should be purchased. Moreover, development of optimal climate-change policies must confront the inevitable trade-offs between devoting resources to address more current issues (e.g., access to clean water, vaccinations against debilitating diseases, and ample supplies of low-cost energy to improve economic growth) and devoting resources to address potential future impacts from climate change. None of these is a simple issue, and all involve inherently subjective factors. Specific INDCs have been published as part of the United Nations Framework for Climate Change. See http://www4.unfccc.int/submissions/indc/Submission%20Pages/submissions.aspx. The INDCs for India and China include no CO2reductions but instead include goals of reducing CO2 emissions per dollar of GDP. A discussion of these issues is far beyond the scope of this paper. U.S. Energy Information Administration, Monthly Energy Review, October 2015. http://www.eia.gov/totalenergy/data/monthly/pdf/sec12_9.pdf. See http://www.epa.gov/cleanpowerplan/clean-power-plan-protects-our-environment-health-economy. A metric ton equals 1,000 kilograms, or 2,204 pounds. Thus, a metric ton equals 1.1 short tons. For ease of discussion, in this paper, the word “ton” means a short ton. U.S. EPA, “Regulatory Impact Analysis for the Clean Power Plan Final Rule,” August 2015 (CPP RIA), pp. 3-5 to 3-7 and table 3-1. (The EPA refers to a cost-benefit analysis as a “Regulatory Impact Analysis.”) http://www2.epa.gov/cleanpowerplan/clean-power-plan-final-rule-regulatory-impact-analysis. CPP RIA, p. 3-13. The EPA’s assumptions about the costs of energy-efficiency measures to accomplish the assumed electricity-demand reductions each year are set out in “Demand-Side Energy Efficiency Technical Support Document,” August 2015. https://www.epa.gov/sites/production/files/2015-11/documents/tsd-cpp-demand-side-ee.pdf. CPP RIA, p. 3-5. If a state does not develop its own plan, the EPA supposedly will develop one for that state. U.S. EIA, “Energy-Related Carbon Dioxide Emissions at the State Level, 2000–2013,” October 2015, p. 11. (The estimate is given in millions of metric tons, which have been converted to short tons.) http://www.eia.gov/environment/emissions/state/analysis/pdf/stateanalysis.pdf. In October 2015, Exelon reached an agreement with the New York Public Service Commission to delay closure of the Ginna Nuclear Plant until March 31, 2017, because that plant is needed to ensure electric-system reliability. The agreement will require upstate customers to pay a surcharge on their monthly electric bills. At this time, it is not clear if the plant will operate after the agreement ends. The six plants are Fitzpatrick, Ginna, Indian Point (units 2 and 3), and Nine Mile Point (units 1 and 2). The calculation is as follows: the EIA assumes that a state-of-the-art, natural gas–fired combined-cycle generating plant has a heat rate (i.e., how much energy must be used to produce one kilowatt-hour of electricity) of 6,333 Btus/kWh, or 6.33 million Btus/MWh. When burned, natural gas emits approximately 118 pounds of CO2 per million Btus. Thus, one MWh of electricity generated from a state-of-the-art, natural gas–fired combined-cycle generator will produce: (6.33 million Btus/MWh) x (118 pounds CO2/million Btus) = 747 pounds CO2/MWh. Replacing all 44.8 million MWh of electricity from the state’s nuclear power plants with electricity from these natural gas plants would produce: (747 pounds CO2/MWh) x (44.8 million MWh) / (2,000 pounds/ton) = 16.7 million tons CO2. See https://www.whitehouse.gov/omb/circulars_a004_a-4. Section E.1 of Circular A-4 requires a regulatory impact analysis to evaluate the benefits and costs of a policy accruing to U.S. residents—and, in cases where a regulation will have international costs and benefits, to report those separately. See https://www.epa.gov/sites/production/files/2015-08/documents/fs-cpp-by-the-numbers.pdf, p. 2. The range of benefits depends on the discount rate used to analyze benefits. The higher the discount rate, the lower the estimated annual benefits. CPP RIA, p. 4-29, table 4-22 . The quantified and non-quantified benefits are all summarized on pp. ES-12 to ES-14, table ES-6. A discussion of these non-quantified benefits is beyond the scope of this paper. CPP RIA, pp. EX-22 and EX-23, tables ES-9 and ES-10. Numerous legal challenges to the CPP have been raised. As of this writing, 27 states have sued the EPA. 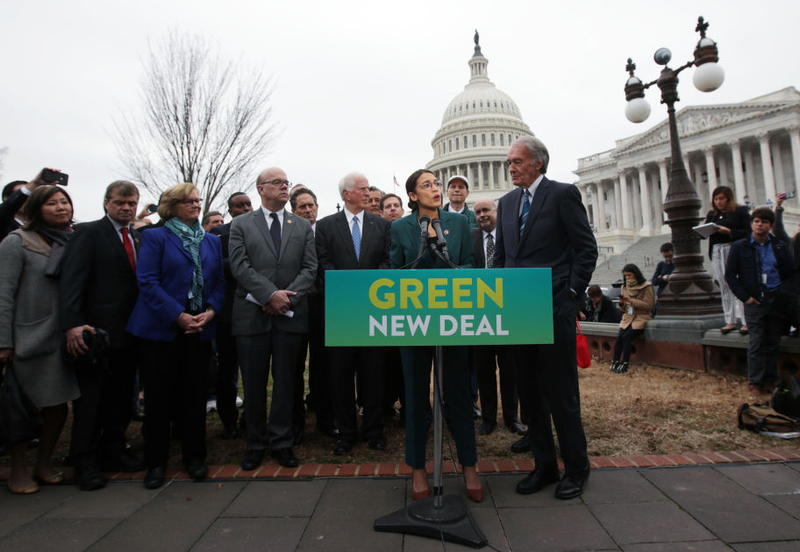 The grounds include: whether the EPA has the authority, under Section 111d of the Clean Air Act, to implement the CPP; whether the EPA can incorporate global benefits in its analysis; and whether the EPA can include co-benefits in its analysis. A discussion of the legal issues surrounding the CPP is beyond the scope of this paper. Greenhouse gases are defined as those that trap heat in the atmosphere by absorbing infrared radiation. Water vapor is a greenhouse gas, as are methane (natural gas) and nitrous oxide (“laughing” gas). The “greenhouse effect” may sound scary, but if it were not for the heat-trapping abilities of these gases, life on earth would be impossible. CPP RIA, p. 3-19, table 3-5. CPP RIA, p. ES-20. The EPA SCC values are reported in 2011 dollars. See CPP RIA, p. 4-8 , table 4-2. The seminal article on the subject is Ronald Coase, “The Problem of Social Cost,” Journal of Law and Economics 3 (1960): 1–44. For a more detailed discussion, including different regulatory responses, see Jonathan Lesser and Leonardo Giacchino, Fundamentals of Energy Regulation, 2d ed. (Reston, Va.: Public Utilities Reports, 2013), pp. 357–86. In fact, CO2 itself is marketed, as it has a number of uses. Some examples: CO2 is used in welding and other industrial applications, frozen CO2 (dry ice) is used as a coolant, and liquid CO2 can be used to decaffeinate coffee. The IWG has 12 members: Council of Economic Advisers; Council on Environmental Quality; Department of Agriculture; Department of Commerce; Department of Energy; Department of Transportation; National Economic Council; Office of Energy and Climate Change; Office of Management and Budget; Office of Science and Technology Policy; Department of the Treasury; and Environmental Protection Agency. In the next section, I discuss how the models used to estimate SCC values make assumptions about what the world’s social welfare function looks like. See BP Energy Outlook 2016. https://www.bp.com/content/dam/bp/pdf/energy-economics/energy-outlook-2016/bp-energy-outlook-2016.pdf. Chris Buckley, “China Burns Much More Coal than Reported, Complicating Climate Talks,” New York Times, November 3, 2015. http://www.nytimes.com/2015/11/04/world/asia/china-burns-much-more-coal-than-reported-complicating-climate-talks.html?_r=0. In fact, nowhere in the CPP RIA is there any discussion of the CPP’s projected physical impact on climate. Nor is there any discussion on the White House Climate Change website. See https://www.whitehouse.gov/climate-change. Interagency Working Group (IWG) on Social Cost of Carbon, “Technical Support Document: Social Cost of Carbon for Regulatory Impact Analysis Under Executive Order 12866,” February 2010 (hereafter, IWG 2010). http://www3.epa.gov/otaq/climate/regulations/scc-tsd.pdf. IWG, “Technical Support Document: Technical Update of the Social Cost of Carbon for Regulatory Impact Analysis Under Executive Order 12866, Update,” July 2015 (hereafter, IWG 2015). https://www.whitehouse.gov/sites/default/files/omb/inforeg/scc-tsd-final-july-2015.pdf. For example, using a 3 percent social-discount rate, the present value of a $10 million impact 200 years from now would be just $27,000 ($10 million / (1 + 0.03)200 = $27,074). The present value of that same $10 million impact using a 7 percent discount rate would be only $13. For a detailed critique of these models, along with the reasons that the model assumptions are arbitrary, see Robert Pindyck, “Climate Change Policy: What Do the Models Tell Us?,” Journal of Economic Literature 51, no. 3 (September 2013): 860–72 (hereafter, Pindyck 2013). http://dspace.mit.edu/openaccess-disseminate/1721.1/88036. For a discussion of how empirical estimates of the SCC have been developed, see William Nordhaus, “Estimates of the Social Cost of Carbon: Concepts and Results from the DICE-2013R Model and Alternative Approaches,” Journal of the Association of Environmental and Resource Economists 1, nos. 1–2 (spring/summer 2014): 273–312. See Pindyck 2013, pp. 863–64. Note that, whereas Pindyck concludes that IPMs are not useful from the standpoint of climate-change policy, he has stated emphatically that this does not mean that he favors no action. Instead, Pindyck believes that a carbon tax should be imposed and that policymakers should view such a tax as insurance against catastrophic risk. See Laurie Johnson, “Robert S. Pindyck in His Own Words (and Yes, He Read and Agreed with This Blog),” August 26, 2013. http://switchboard.nrdc.org/blogs/ljohnson/robert_s_pindyck_in_his_own_wo.html. However, the concept of a CO2 tax as a form of insurance has also been challenged. See Robert Murphy, Patrick Michaels, and Paul Knappenberger, “The Case Against a Carbon Tax,” CATO Working Paper 33, September 4, 2015. http://www.cato.org/publications/working-paper/case-against-carbon-tax. For a summary, see Leon Clarke et al., “International Climate Policy Architectures: Overview of the EMF 22 International Scenarios,” Energy Economics 31 (special issue, December 2009): S64–S81. https://web.stanford.edu/group/emf-research/docs/emf22/EMF22OverviewClarke.pdf. Both the 2013 and 2015 IWG report updates of SCC values used the same emissions scenarios that were shown in the 2010 IWG report. See, e.g., IWG 2015, p. 4. Because other gases contribute to global warming, scientists use the CO2-equivalent, or “CO2e” measure. According to IWG 2010, a 550 ppm CO2e level is equivalent to CO2 concentrations of 425–84 ppm. Pindyck 2013, pp. 863–64. A Monte Carlo simulation gets its name from the eponymous gambling haven. In effect, such simulations select parameter values at random from a user-specified probability distribution. The models are run hundreds of times; each time, a different parameter value is “drawn” from each parameter’s probability distribution. The result is to create what appears to be a probability distribution of model results—in this case, SCC values. There are two problems with this approach: the probability distributions for the parameters are selected arbitrarily; and combinations of parameters selected independently may be unrealistic or even impossible. The economic output changes shown in Figure 5, which are from the 2010 IWG report, and the SCC values shown in Figure 7 cannot be compared directly, for several reasons. First, the PAGE and DICE models used by the IWG to calculate the SCC values in Figure 7 are updated from the versions of those models used in the 2010 IWG report. Second, because the models incorporate different assumptions about climate sensitivity (i.e., how emissions of CO2translate into future temperature changes), a given temperature change in 2100 shown in Figure 5 corresponds to different quantities of CO2 emitted in prior years. See, e.g., David Burgess and Richard Zerbe, “Appropriate Discounting for Benefit-Cost Analysis,” Journal of Benefit-Cost Analysis 2, no. 2 (2011): 1–18 (hereafter, Burgess and Zerbe 2011); Partha Dasgupta, “Discounting Climate Change,” Journal of Risk and Insurance 37 (2008): 141–69. See, e.g., Nicholas Stern, “The Economics of Climate Change.” American Economic Review 98, no. 2 (2008): 1–37; Geoffrey Heal, “Climate Economics: A Metareview and Some Suggestions for Future Research,” Review of Environmental Economics and Policy 3, no. 1 (2009): 4–21. Mark Fleurbaey and Stéphane Zuber, “Climate Policies Deserve a Negative Discount Rate,” Chicago Journal of International Law 13 (2012): 565–95. http://chicagounbound.uchicago.edu/cjil/vol13/iss2/14. This is discussed in Burgess and Zerbe 2011. CPP RIA, p. ES-22 n. b. To see this, consider simultaneously buying a zero-coupon bond to obtain the future benefits and selling a bond to pay for the costs, with each bond having a $10 billion maturity value in 2050. If the two bonds have different discount rates, they will have different purchase prices. But that means that there is an arbitrage opportunity that is unlimited. See IWG 2010, pp. 17–20. A recent report by Patrick Michaels discusses the discrepancy between SCC estimates and future world GDP in greater detail; written statement of Patrick Michaels, before the U.S. House of Representatives, Natural Resources Committee, July 22, 2015. http://www.cato.org/publications/testimony/analysis-obama-administrations-social-cost-carbon, pp. 16–19. See EIA Annual Energy Outlook 2015, table A19, which reports a value of 5.5 billion metric tons, or just over 6 billion short tons. Bjorn Lomborg, “Impacts of Current Climate Proposals,” Global Policy (2015): 1–11, 4. http://onlinelibrary.wiley.com/doi/10.1111/1758-5899.12295/epdf (hereafter, Lomborg 2015). To develop these temperature-change estimates, Lomborg uses the “Model for the Assessment of Greenhouse Gas Induced Climate Change” (MAGICC). MAGICC was funded by the EPA and developed by the National Center for Atmospheric Research. A description of MAGICC can be found at http://www.cgd.ucar.edu/cas/wigley/magicc. The model can be downloaded at http://www.cgd.ucar.edu/cgi-bin/cas/magicc.cgi. See also testimony of Paul Knappenberger before the U.S. House of Representatives Committee on Science, Space, and Technology, “The Administration’s Empty Promises for the International Climate Treaty,” November 18, 2015. http://www.cato.org/publications/testimony/administrations-empty-promise.... Knappenberger also uses MAGICC to project temperature changes resulting from the CPP and the administration’s stated goal of an 80 percent reduction in CO2 emissions by 2050. Using MAGICC, he estimates that the 80 percent reduction will yield a global temperature reduction of 0.11°C. Oligopoly refers to a market in which there are only a few competitors, each having market power. In economics, a leader-follower approach, when applied to oligopolistic market behavior, is called a Stackelberg model. In the Stackelberg model, the leader determines its behavior by evaluating alternatives and, for each alternative, determining the follower’s response. For an introduction, see Dennis Carlon and Jeffrey Perloff, Modern Industrial Organization, 2nd ed. (New York: Harper Collins, 1994), pp. 250–53. W. Pizer et al., “Using and Improving the Social Cost of Carbon,” Science 346, no. 6214 (December 2014): 1189–90. The Kyoto Protocol promised to cut the emissions of industrialized countries, by 2008–12, by 5.2 percent below 1990-level emissions. The protocol was rejected by the U.S. Senate, 98-0. Lomborg 2015, pp. 4–6. As he points out, this commitment is only for 2025. The actual U.S. submission can be found at http://www4.unfccc.int/submissions/INDC/Published%20Documents/United%20States%20of%20America/1/U.S.%20Cover%20Note%20INDC%20and%20Accompanying%20Information.pdf. P. 3 of this document states the U.S. commitment. E.g., article 4, item 2, of the Paris Agreement states: “Each Party shall prepare, communicate and maintain successive nationally determined contributions that it intends to achieve. Parties shall pursue domestic mitigation measures with the aim of achieving the objectives of such contributions” (emphasis added). http://ec.europa.eu/clima/policies/international/paris_protocol/docs/com_2015_81_annex_en.pdf. Yet another complexity is introduced by considering countries with the CO2 emissions-equivalent of market power. For example, as the country having the greatest CO2 emissions—and with those emissions forecast to increase—China might be able to threaten not to meet its obligations unless other countries pay it to do so, effectively a form of climate blackmail. Lomborg 2015, p. 9, table 1. Recall that the FUND model shows increased economic output for small temperature changes; therefore, one cannot simply refer to reductions in global temperatures. The benefits equal the area under the marginal SCC curve. EPA, “Regulatory Impact Analysis for the Final Mercury and Air Toxics Standards,” December 2011 (MATS RIA), p. ES-6, table ES-4. http://www3.epa.gov/mats/pdfs/20111221MATSfinalRIA.pdf. Ozone RIA, p. 6-2, table 6-1. Below, I discuss how the EPA defined “premature death” for purposes of estimating health co-benefits. For NOx, the EPA estimated two benefit-per-ton values: NOx that forms particulates; and NOx that creates ground-level ozone. The discount rate affects the $/ton values because the health effects from exposure to these pollutants occur over several years. All values are in 2011 dollars. CPP RIA, p. 4-24, table 4-9. Incidence rates are shown in the appendix to chap. 4 of the CPP RIA. Incidence rates for particulate exposure are shown in tables 4A-6 to 4A-8. Incidence rates for ground-level ozone exposure are shown in tables 4A-12 to 4A-14. The $/ton values shown in Figure 10 can be compared with those shown in CPP RIA, table 4A-11. The differences arise because the spreadsheets that I obtained from the EPA, under a FOIA request, back into the per-ton values by taking overall benefits estimates and dividing by emissions reductions. These spreadsheets also show that, although the EPA refers to the $/ton values as reflecting reductions in premature mortality, those values include other health-related effects, such as hospital emergency-room visits and lost school days. Copies of these spreadsheets are available from the author. Table 4-21 of the CPP RIA (p. 4-28) rounds the values shown in Figure 10 to a range of SO2 co-benefits of $10 billion to $23 billion. To distinguish its integrated planning model for electricity demand from the IPMs used to estimate the SCC values, I refer to the former as the EPA “electric planning model,” or EPM. The footnotes to tables 4-16 to 4-21 (pp. 4-26 to 4-28) of the CPP RIA all state that the EPA did not estimate the monetized health benefits from reductions in direct PM2.5 emissions because those benefits are relatively small. However, p. 4A-8 of the appendix to chap. 4 of the CPP RIA does discuss estimates of the value of direct reductions in PM2.5 emissions. The EPA reports these values in appendix 4 of the CPP RIA. U.S. EIA, Annual Energy Outlook 2015, with projections to 2040, September 2015. http://www.eia.gov/forecasts/aeo/pdf/0383(2015).pdf. A discussion of the structure of NEMS can be found in “Assumptions for the Annual Energy Outlook 2015,” September 2015. See, esp., p. 3, fig. 1. http://www.eia.gov/forecasts/aeo/assumptions/pdf/introduction.pdf. The program can be downloaded at https://www.epa.gov/benmap/benmap-community-edition. Daniel Krewski et al., “Extended Follow-Up and Spatial Analysis of the American Cancer Society Study Linking Particulate Air Pollution and Mortality,” HEI Research Report 140, Health Effects Institute, Boston, 2009 (hereafter, Krewski et al. 2009). http://www.healtheffects.org/Pubs/RR140-Krewski.pdf; Johanna Lepeule et al., “Chronic Exposure to Fine Particles and Mortality: An Extended Follow-Up of the Harvard Six Cities Study from 1974 to 2009,” Environmental Health Perspectives 120, no. 7 (2012): 965–70 (hereafter, Lepeule et al. 2012). http://ehp.niehs.nih.gov/wp-content/uploads/120/7/ehp.1104660.pdf. The health benefits associated with reduced infant mortality are based on a single study. See Tracy Woodruff, Jeanne Grillo, and Kenneth Schoendorf, “The Relationship Between Selected Causes of Postneonatal Infant Mortality and Particulate Air Pollution in the United States,” Environmental Health Perspectives 105, no. 6 (1997): 608–12. http://www.jstor.org/stable/3433606. To clarify, a VSL estimate does not mean that an individual’s life is “worth” that amount. In other words, if the estimated VSL is $10 million, it does not mean one can “purchase” the right to end Grandma’s life for that amount of money. The other, less common, approach to calculating VSLs is to ask people what they are willing to pay to avoid certain risks. For a discussion of VSL calculations and controversies, see Cass Sunstein, “The Value of a Statistical Life: Some Clarifications and Puzzles,” Journal of Benefit-Cost Analysis 4 (2013): 237–61. http://journals.cambridge.org/abstract_S2194588800000609. CPP RIA, p. 4-19. Here, the CPP RIA refers to the EPA’s Guidelines for Preparing Economic Analysis. http://yosemite.epa.gov/ee/epa/eerm.nsf/vwAN/EE-0568-50.pdf/$file/EE-0568-50.pdf. Appendix B to that document provides the results of the 26 studies and a mean value of $7.4 million (2006 dollars), or $8.1 million in 2011 dollars, using the Federal Reserve GDP implicit price deflator. The income growth projections are within the BenMAP-CE model and—according to the EPA—extend only to 2024. CPP RIA, p. 4-20 n. 106. VSL is another uncertainty, as it cannot be measured directly. However, VSL is clearly greater than zero, whereas the reductions in premature deaths may not be. An increase in a generating plant’s operating efficiency implies a decrease in its heat rate: the heat rate measures the amount of total energy input per kWh of electricity generated. CPP RIA, p. 3-24. The $100/kW cost assumption would mean that a coal plant with a 500 MW generating capacity could increase its operating efficiency at a cost of (500 MW) x (1,000 kW/MW) x ($100/kW) = $50 million. The source of the heat rate and cost/kW assumptions can be found in chap. 2 of “Technical Support Document (TSD) for Carbon Pollution Guidelines for Existing Power Plants: Emission Guidelines for Greenhouse Gas Emissions from Existing Stationary Sources: Electric Utility Generating Units,” August 3, 2015 (GHG TSD). The break-even analysis is discussed on pp. 2-62 to 2-65 of the GHG TSD. https://www.regulations.gov/#!documentDetail;D=EPA-HQ-OAR-2013-0602-0437. CPP RIA, p. 3-24 n. 81. Ibid., p. 3-25, table 3-10. The capacity factor of a generating plant is just its average expected generation divided by its potential generation at full operating capacity. For example, a 100 MW generating unit, running every hour of the year, would produce 876,000 MWh of electricity. If the plant is expected to run only half the time and generate half that amount of electricity, its capacity factor would be 50 percent. Existing renewable generation, such as wind and solar facilities, have average annual capacity factors of about 30 percent and 20 percent, respectively. The relationship between capacity factor and average heat rates for coal-fired plants is discussed in GHG TSD 2015, pp. 2-34 to 2-36. Curiously, the EPA’s break-even analysis is based on its base-case assumptions of a 78 percent average coal plant capacity factor; yet the EPA assumes no such improvements in the base case and—under the CPP compliance assumptions—the average capacity factor of coal-fired plants will be between 69 percent and 75 percent. “National Emission Standards for Hazardous Air Pollutants From Coal- and Oil-Fired Electric Utility Steam Generating Units and Standards of Performance for Fossil-Fuel-Fired Electric Utility, Industrial-Commercial- Institutional, and Small Industrial-Commercial-Institutional Steam Generating Units,” February 2012. The rule was published in the Federal Register. http://www3.epa.gov/ttn/atw/utility/fr16fe12.pdf. The author thanks Dr. Neal Fann of the EPA for his assistance in answering my questions about the modeling approach used by the agency to estimate health co-benefits. Although the EPA also estimated reductions in infant mortality, the relative incidence-per-ton values for infants are lower by several orders of magnitude. Moreover, the infant mortality study is based on a published study that is now almost 20 years old. Therefore, the following discussion focuses solely on the adult mortality issue. Further, neither of these two studies (Krewski et al. and Lepeule et al. ), nor the studies on which they are based, defines “premature mortality.” Instead, they evaluate correlations between death and pollutant exposure. Specifically, because the probability of eventual death is 100 percent, simply counting all deaths from heart disease, lung cancer, and so forth linked to PM2.5 and ozone exposure overestimates the pollutants’ impacts on premature mortality. There is an alternative concept, known as “years of potential life lost,” which can be used to estimate premature mortality. The EPA did not use this concept to estimate mortality reductions in its analysis. U.S. Centers for Disease Control, “Principles of Epidemiology in Public Health Practice,” 3rd ed., “An Introduction to Applied Epidemiology and Biostatistics,” 2012, sec. 1. http://www.cdc.gov/ophss/csels/dsepd/ss1978/lesson1/section1.html. Krewski et al. 2009, p. 14. Lepeule et al. 2012, p. 966. The log-linear relationship between excess mortality risk and exposure is based on the following exponential equation: ΔY=Y0(eßΔc-1).POPt, where ΔY = the reduction in the number of premature deaths, Y0 = the baseline rate of premature death, POPt = the population in year t, ΔC = the change in PM2.5 concentration, and ß = the relative risk factor estimated from statistical studies of premature death and PM2.5 concentration. Taking logarithms of both sides of the equation, a straight-line relationship is estimated: log(ΔY)=K+ß•ΔC, where K is a constant. Krewski et al. 2009, p. 20. These are 24-hour average levels. See “National Trends in Particulate Matter Levels.” https://www3.epa.gov/airtrends/pm.html. In economic terms, this is called a “censored” regression. The lack of observed data below the minimum observed concentration level leads to a bias in the estimated dose-response function. For a discussion of censored regression models, see Gangadharrao Maddala, Limited-Dependent and Qualitative Variables in Econometrics (New York: Cambridge University Press, 1983), chap. 6. As the CPP RIA states, “This analysis is no exception. This analysis includes many data sources as inputs, including emission inventories, air quality data from models (with their associated parameters and inputs), population data, population estimates, health effect estimates from epidemiology studies, economic data for monetizing co-benefits, and assumptions regarding the future state of the world (i.e., regulations, technology, and human behavior). Each of these inputs may be uncertain and would affect the estimate of co-benefits. When the uncertainties from each stage of the analysis are compounded, even small uncertainties can have large effects on the total quantified benefits. In addition, the use of the benefit-per-ton approach adds additional uncertainties beyond those for analyses based directly on air quality modeling. Therefore, the estimates of co-benefits in each analysis year should be viewed as representative of the general magnitude of co-benefits of the illustrative plan approach, rather than the actual co-benefits anticipated from implementing the final emission guidelines” (pp. 4-36 to 4-37; emphasis added). Natural sources of particulates and ground-level ozone also mean that zero concentration levels can never be reached. For example, in the EPA’s “Regulatory Impact Analysis: Standards of Performance for New Stationary Sources and Emission Guidelines for Existing Sources: Commercial and Industrial Solid Waste Incineration Units,” February 2011, the agency states: “When calculating the [PM2.5 reduction] estimate, the EPA applied the effect coefficient as reported in the study without an adjustment for assumed concentration threshold of 10 μg/m3 as was done in recent (2006–2009) Office of Air and Radiation RIAs” (p. 5-3). http://www3.epa.gov/ttnecas1/regdata/RIAs/CISWIRIAfinal110221_psg2.pdf. Julie Goodman et al., “Are the Elements of the Proposed Ozone National Ambient Air Quality Standards Informed by the Best Available Science?,” Regulatory Toxicology and Pharmacology 72, no. 1 (June 2015): 134–40. http://www.sciencedirect.com/science/article/pii/S0273230015000719. See Boyden Gray, “EPA’s Use of Co-Benefits,” Federalist Society, September 24, 2015 (hereafter, Gray 2015). http://www.fed-soc.org/publications/detail/epas-use-of-co-benefits. Gray 2015, p. 32, makes this argument. EPA Base Case v.5.15 Using IPM, Incremental Documentation, August 2015, pp. 1–2. https://www.epa.gov/sites/production/files/2015-08/documents/epa_base_case_v515_documentation_supplement_for_final_cpp.pdf. Kelly Donham et al., “Exposure Limits Related to Air Quality and Risk Assessment,” in Iowa Concentrated Animal Feeding Operations Air Quality Study. ISU/UI Study Group, University of Iowa College of Public Health, Iowa City, pp. 164–83, 177. https://www.public-health.uiowa.edu/ehsrc/CAFOstudy/CAFO_8.pdf. EPA, “Regulatory Impact Analysis for the Proposed Carbon Pollution Guidelines for Existing Power Plants and Emission Standards for Modified and Reconstructed Power Plants,” June 2015 (Draft CPP RIA). http://www2.epa.gov/sites/production/files/2014-06/documents/20140602ria-clean-power-plan.pdf. EPA, “Regulatory Impact Analysis of the Final Revisions to the National Ambient Air Quality Standards for Ground-Level Ozone,” September 2015 (Ozone RIA), p. ES-2. https://www.regulations.gov/contentStreamer?documentId=EPA-HQ-OAR-2013-0169-0057&disposition=attachment&contentType=pdf. The exception would be if a specific rule mandated closure of a given generating unit. See CPP RIA, p. 3-18, table 3-4, for a summary of reporting and record-keeping costs in 2020, 2025, and 2030. AEO 2015, table A2. Data reported in quadrillion Btus (quads), converted to GWh, where 1 GWh = 3.41 billion Btus. CPP RIA, p. 3-31, table 3-12. See CPP RIA, pp. 3-12 to 3-16. Ibid., p. 3-23, table 3-9. The $180.1 billion value refers to the mass-based approach. Ibid., p. 3-15, table 3-3. This table reports annualized energy-efficiency costs, based on the assumed life of energy-efficiency investments. I discuss the EPA’s use of annualized energy-efficiency costs below. Ibid., p. ES-9, table ES-5, and p. 3-22, table 3-8. Ibid., pp. 4-4 to 4-5. The CPP RIA briefly discusses secondary impacts (i.e., the ripple effects of higher electricity prices on the cost to produce other goods and services) and the effects on future economic growth but provides no analysis or estimates of these economy-wide impacts. This is known as the “Jevons paradox,” after the nineteenth-century British economist William Stanley Jevons. Jevons discovered that improving the efficiency of producing steam power from coal led to an increase in coal consumption. Jevons documented this effect in his book The Coal Question. Snapback effects from energy-efficiency investments have been studied extensively. See, e.g., Michaels Energy, “Demand Response and Snapback Impact Study,” report prepared for the Minnesota Dept. of Commerce, Division of Energy Resources, August 2013. http://www.michaelsenergy.com/PDFs/40697-Michaels-2013-DR-Snapback.pdf. For a more general discussion, see Kenneth Gillingham et al., “The Rebound Effect and Energy Efficiency Policy,” Review of Environmental Economics and Policy 10 (Winter 2016): 68–88. “Demand-Side Energy Efficiency Technical Support Document,” August 2015 (hereafter, EE TSD), pp. 29–30. https://www.epa.gov/sites/production/files/2015-11/documents/tsd-cpp-demand-side-ee.pdf. Ibid., p. 3-13, and table 3-2. CPP RIA, p. 3-3. How this discount rate is derived is discussed in chap. 8 of the IPM documentation. http://www2.epa.gov/sites/production/files/2015-08/documents/chapter_8_financial_assumptions.pdf. The difference can be seen in the EPA’s own example, presented in the EE TSD, by comparing table 31 (p. 73), which provides calculations for South Carolina. As this example shows, the EPA estimates the actual first-year cost at $423 million—half of which is assumed to be borne by consumers—but annualizes that cost to just under $50 million. Recall that the SCC estimates are present-value estimates. This is yet another example of the EPA’s flawed apples-to-oranges analysis approach. CPP RIA, p. 3-40, table 3-22. The other sources are wood and wood-derived fuels, geothermal, and biomass. These generating resources are not expected to increase significantly over time. U.S. EIA, Electric Power Monthly. http://www.eia.gov/electricity/monthly/epm_table_grapher.cfm?t=epmt_6_07_b. EPA, Documentation for Integrated Planning Model v.5.13, chap. 4, table 4-21. Refers to onshore wind development, Class 3-7. Ibid., tables 4-22 and 4-23. EP Integrated Planning Model v.5.13 Documentation, chap. 4, “Generating Resources,” p. 4-61, table 4-28. https://www.epa.gov/airmarkets/documentation-base-case-v513-generating-resources. The winter and summer solar PV generation profiles for each state can be downloaded from https://www.epa.gov/sites/production/files/2015-07/table_4-20_representative_wind_generation_profiles.xlsx; and https://www.epa.gov/sites/production/files/2015-07/table_4-28_representative_solar_generation_profiles.xlsx. Ibid., chap. 2, pp. 2–10: “EPA Base Case v.5.13 does not exercise IPM’s capability to model the building of new transmission lines. However, that capacity of the model is described here in case it is applied in future analyses.” The documentation for v.5.15, which the EPA used to model the costs of the CPP, has no discussion of new transmission infrastructure. In fact, the word “transmission” does not appear in the document. https://www.epa.gov/sites/production/files/2015-08/documents/epa_base_case_v.5.15_incremental_documentation_august_2015.pdf. A recent study prepared by the Institute for Energy Research developed estimates of firming costs of $15/MWh–$30/MWh. See “The Levelized Cost of Electricity from Existing Energy Resources,” June 2015, pp. 28–31. http://instituteforenergyresearch.org/wp-content/uploads/2015/06/ier_lcoe_2015.pdf. OMB Circular A-4, sec. E.1. As discussed in Section II above, the EPA views the CPP in a strategic framework, suggesting that the CPP must be implemented so that other nations, such as China and India, will implement their own CO2 reductions. For a discussion, see Jonathan Lesser, “Less Carbon, Higher Prices: How California’s Climate Policies Affect Lower-Income Residents,” Manhattan Institute, Center for Energy Policy and the Environment, Report CEPE-17, July 2015.